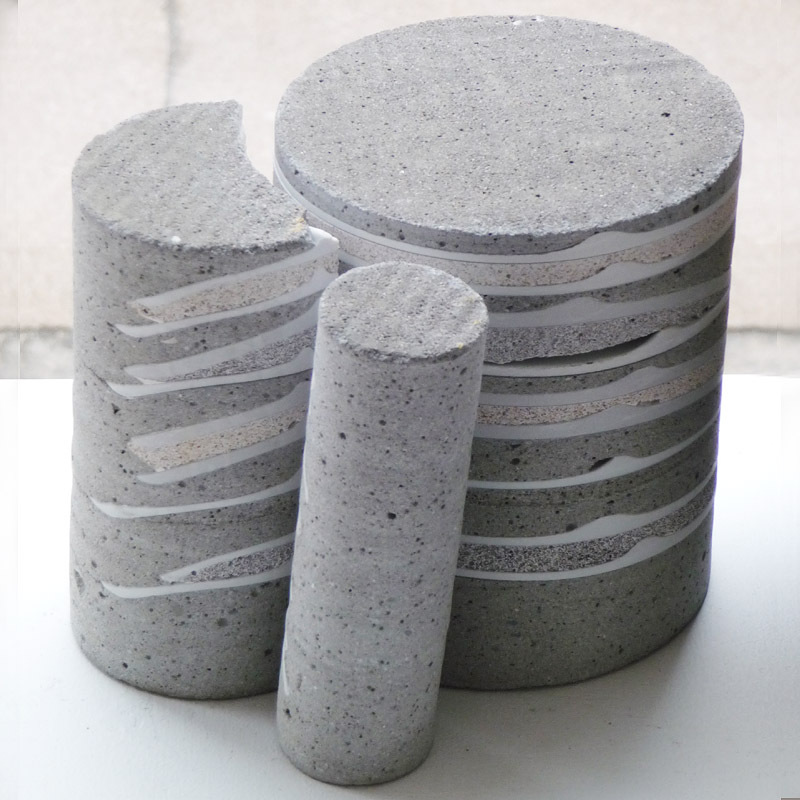 Textile and ceramics meet in new materialities - concrete and inconcrete. 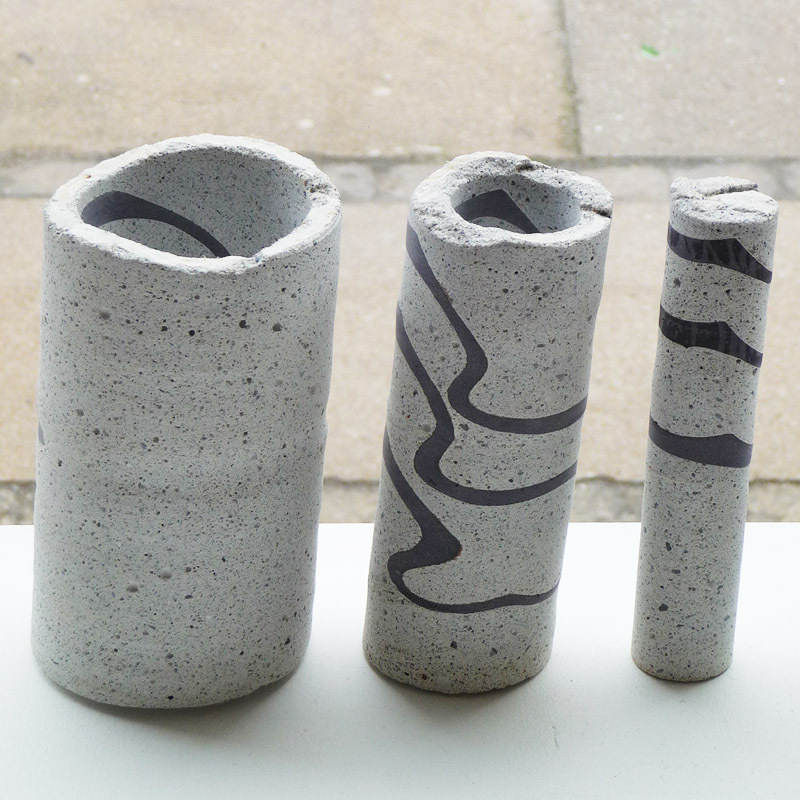 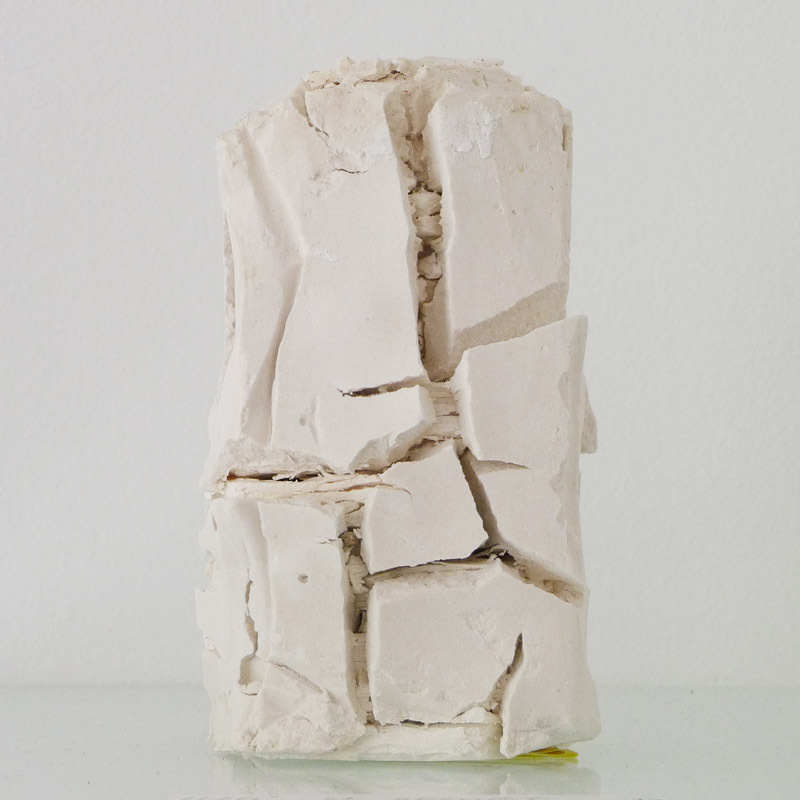 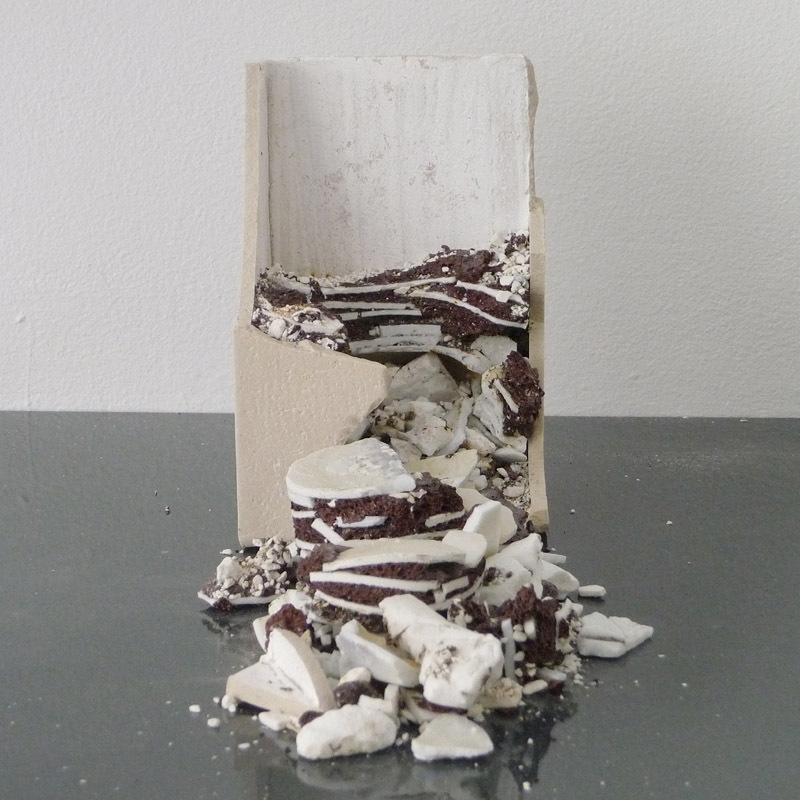 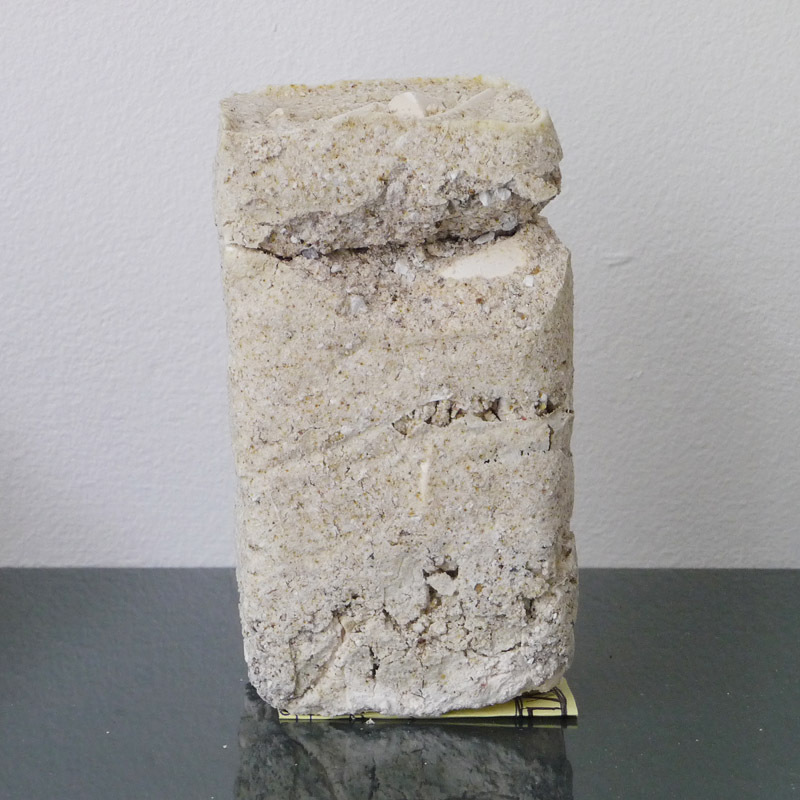 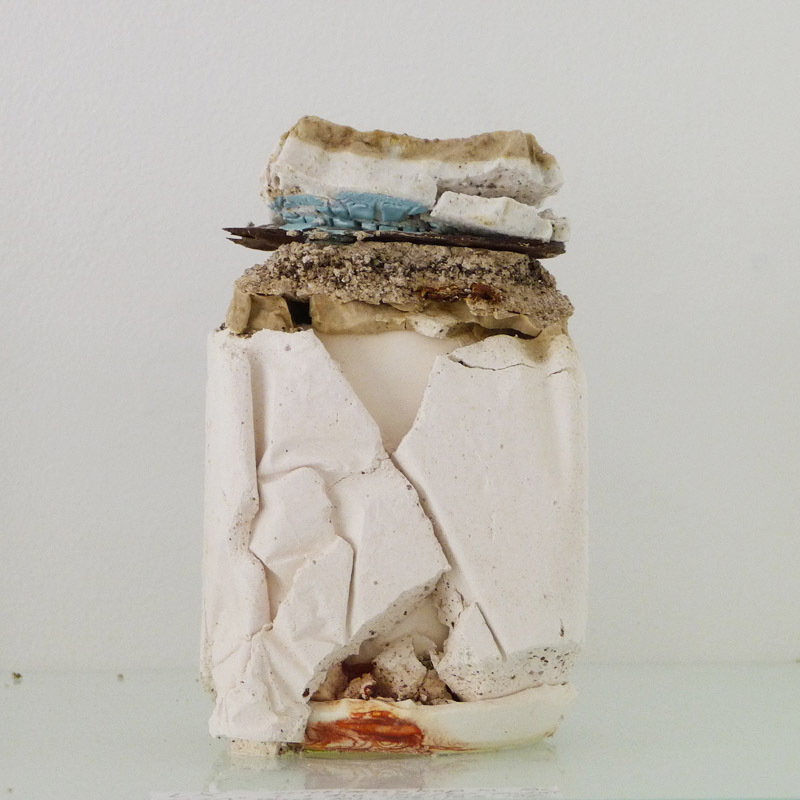 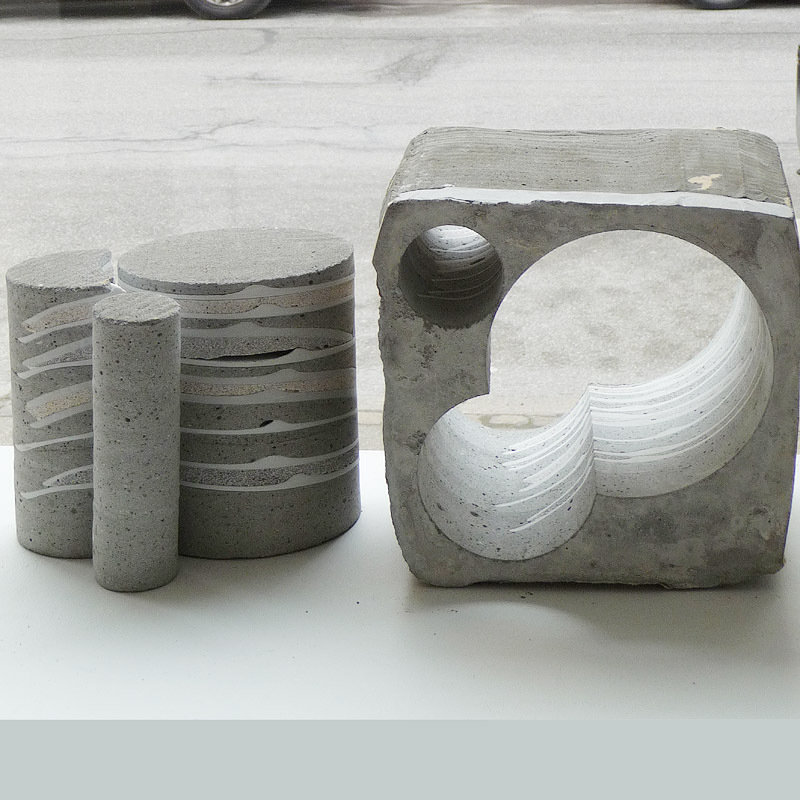 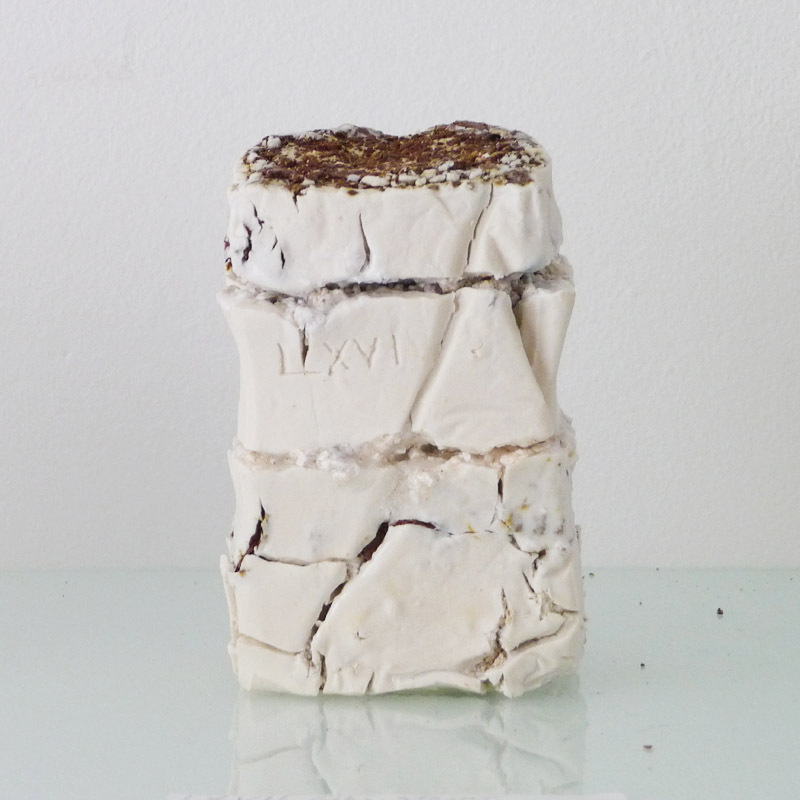 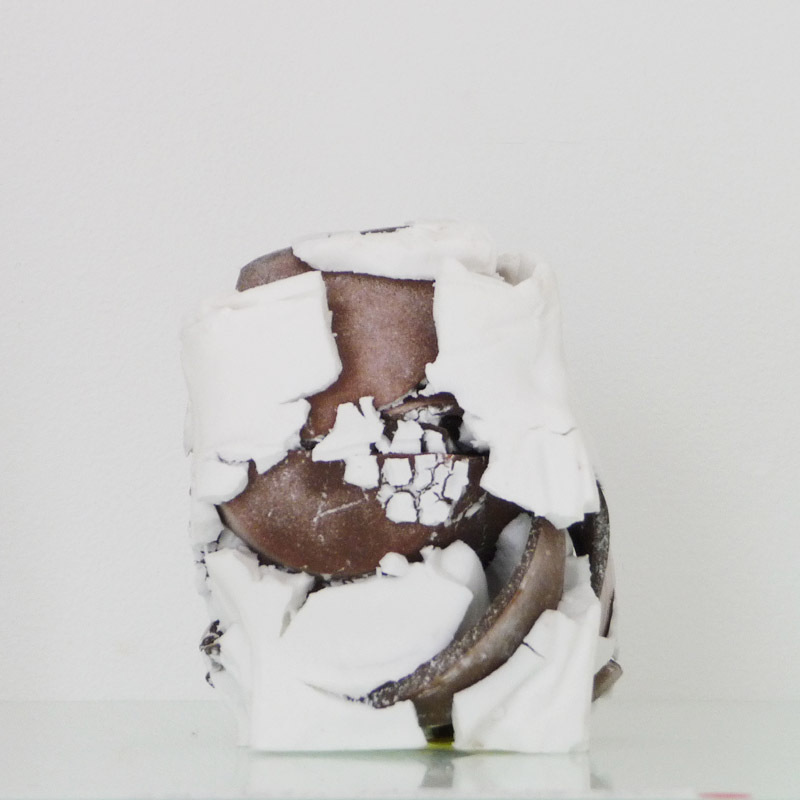 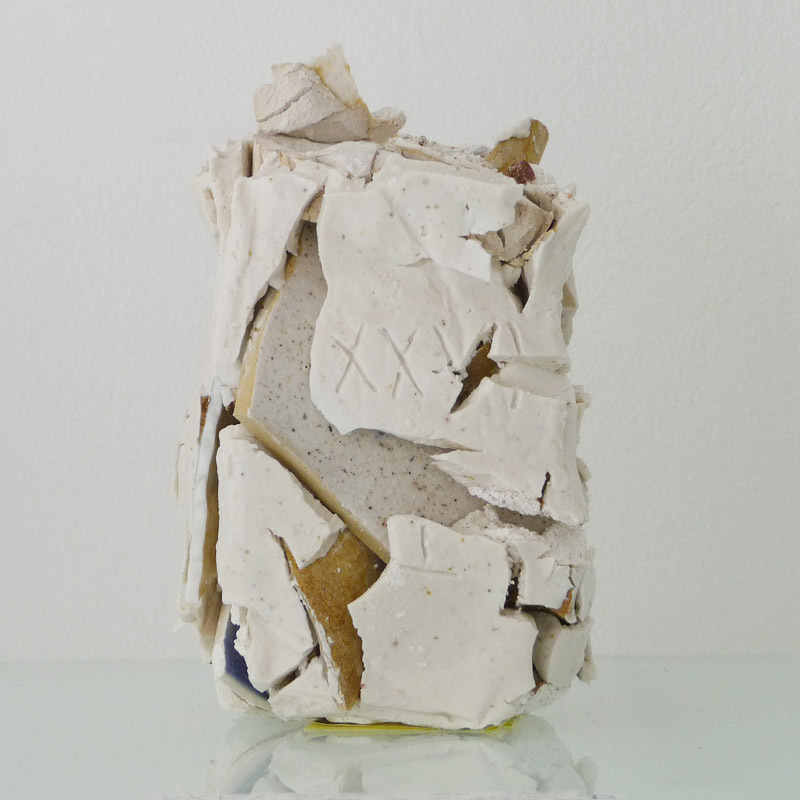 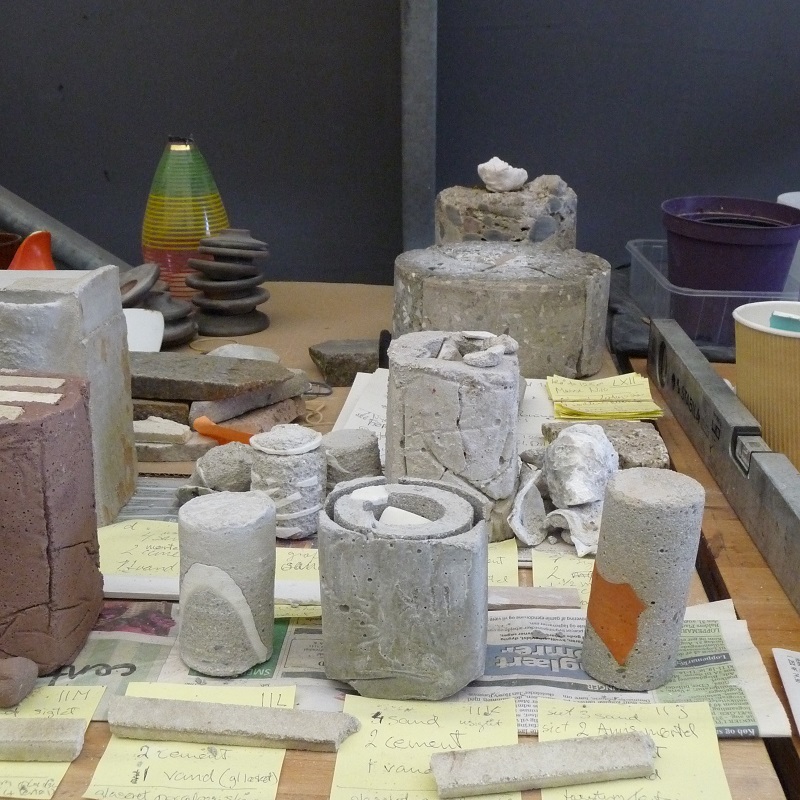 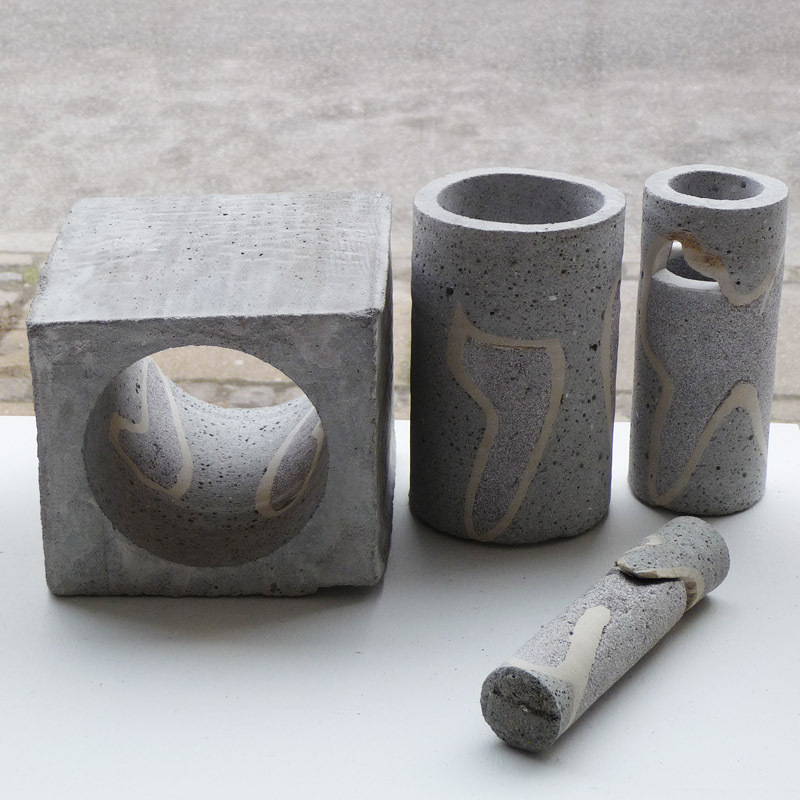 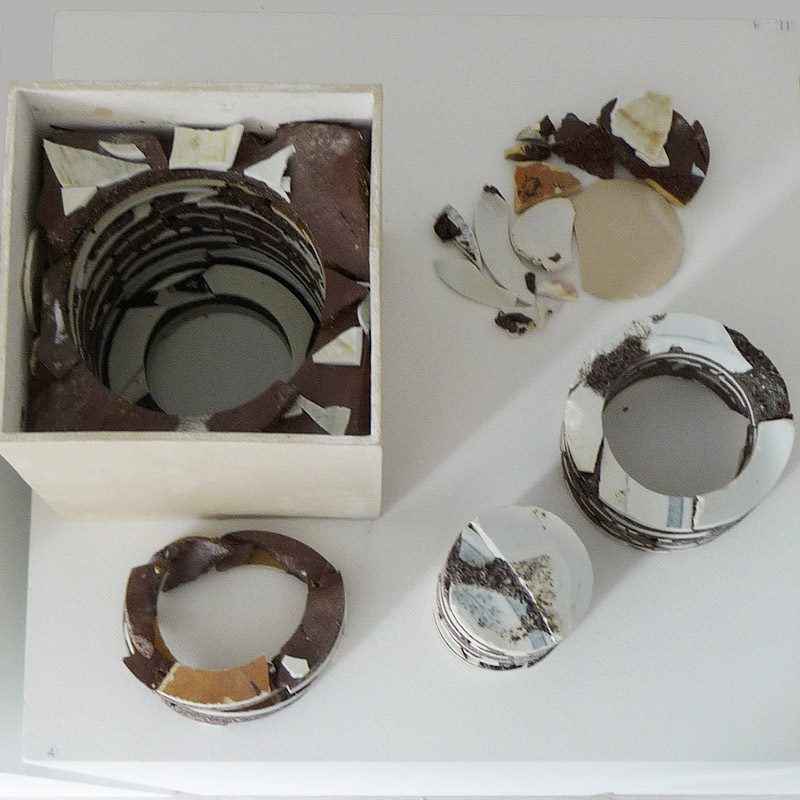 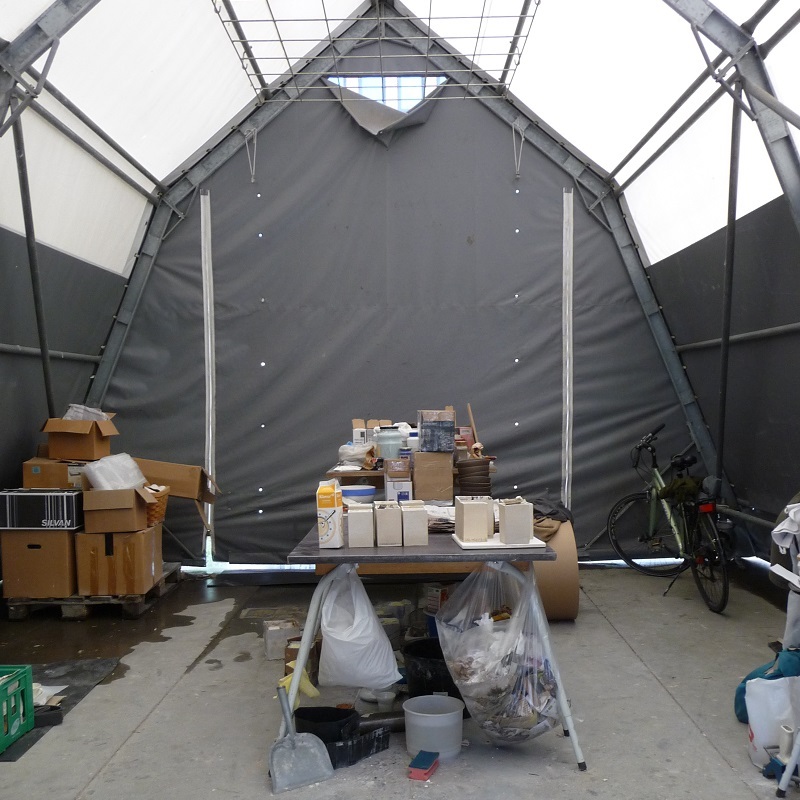 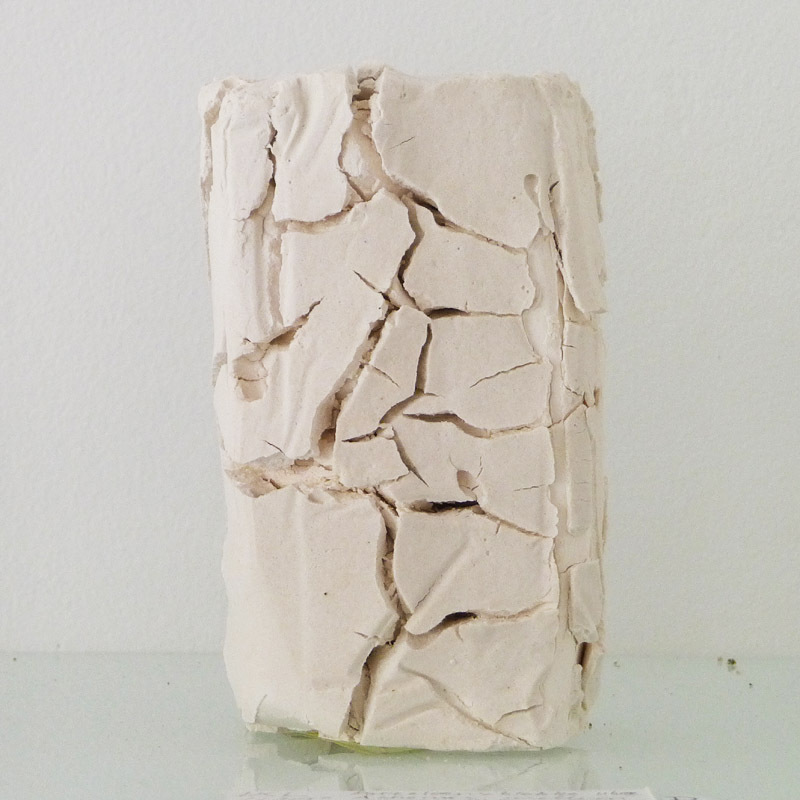 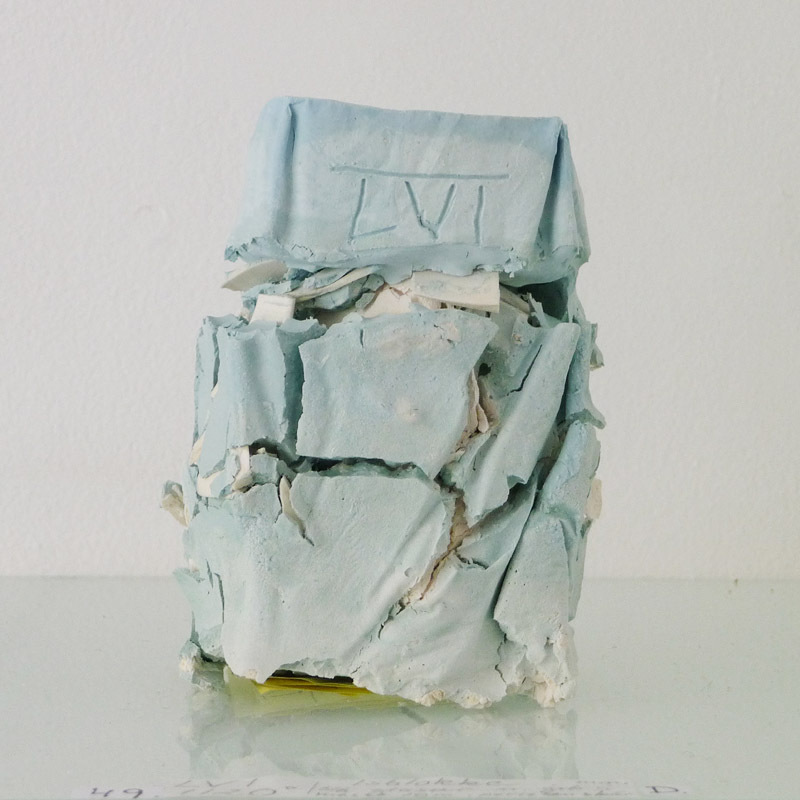 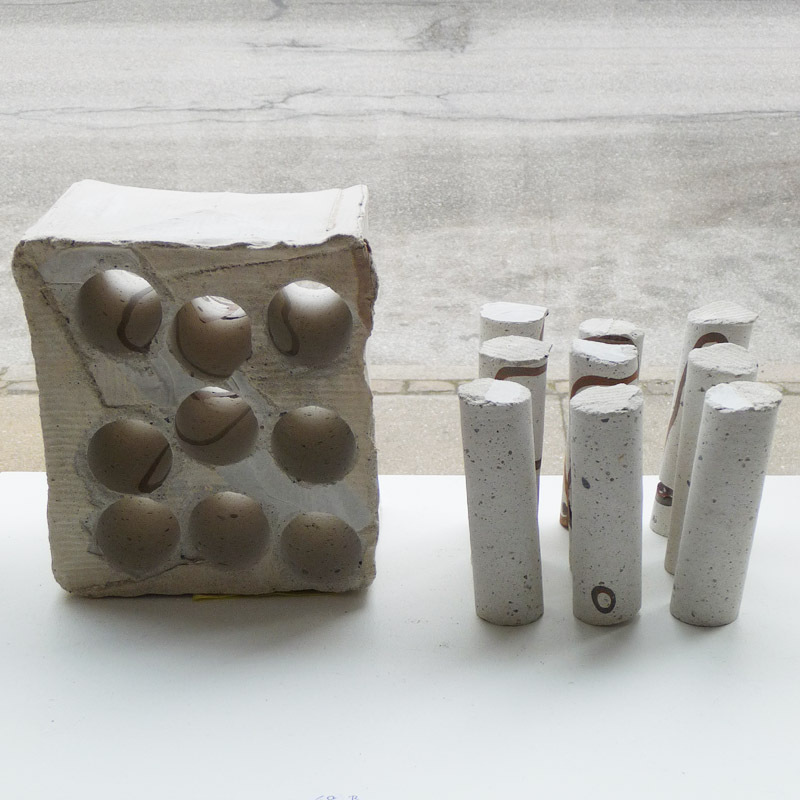 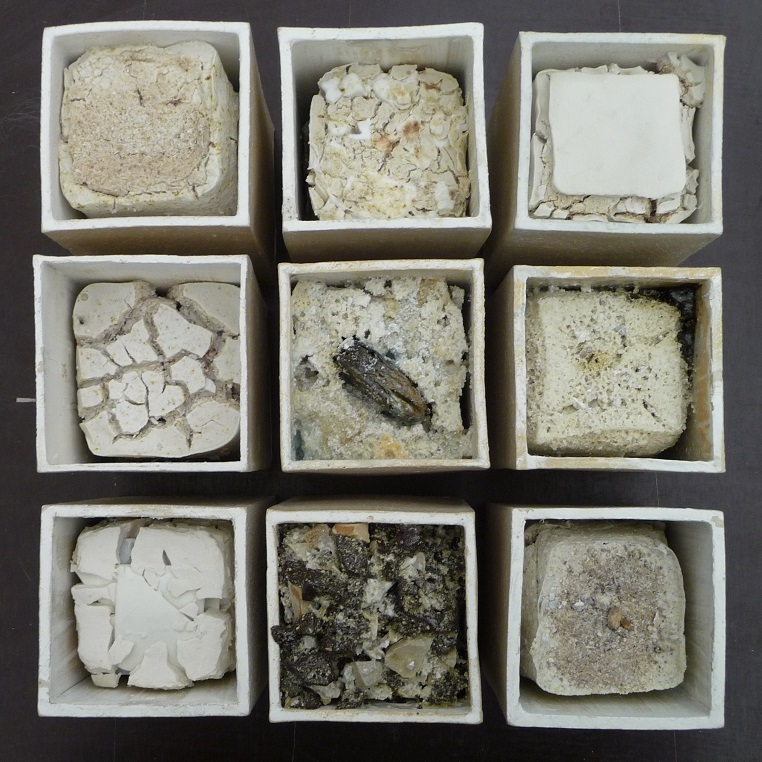 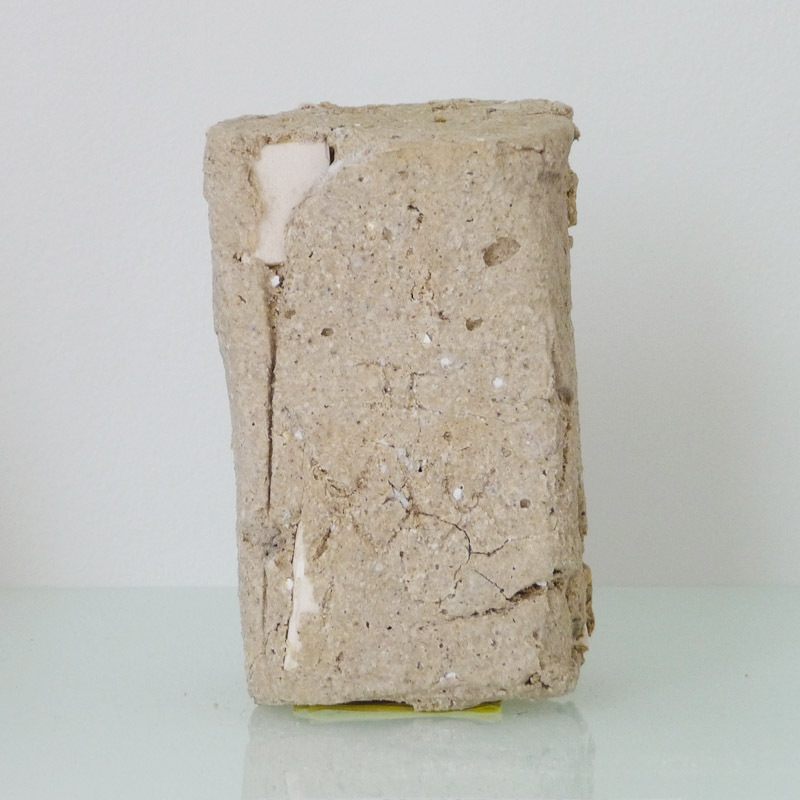 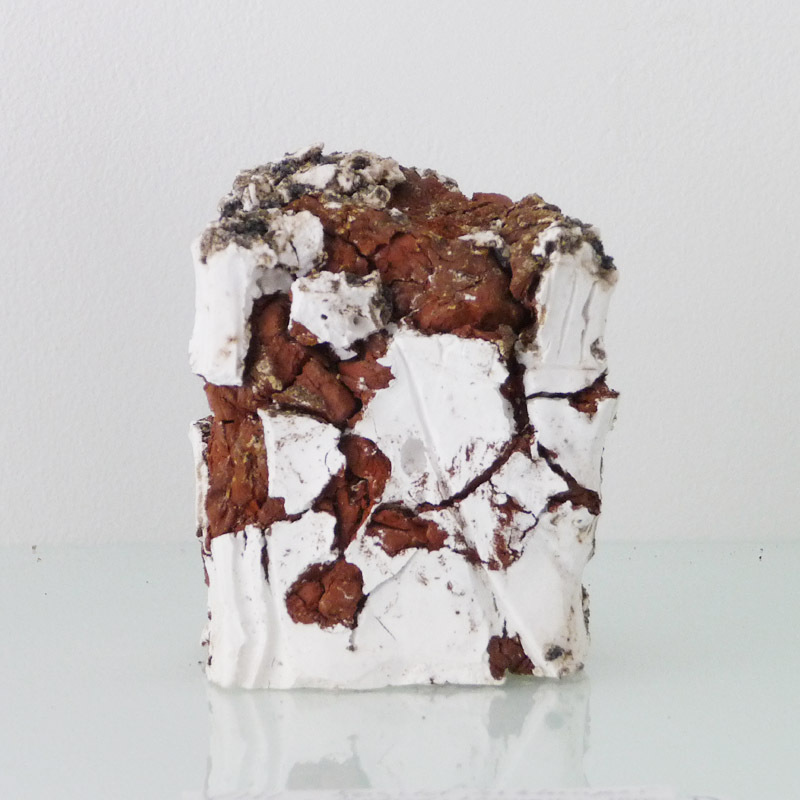 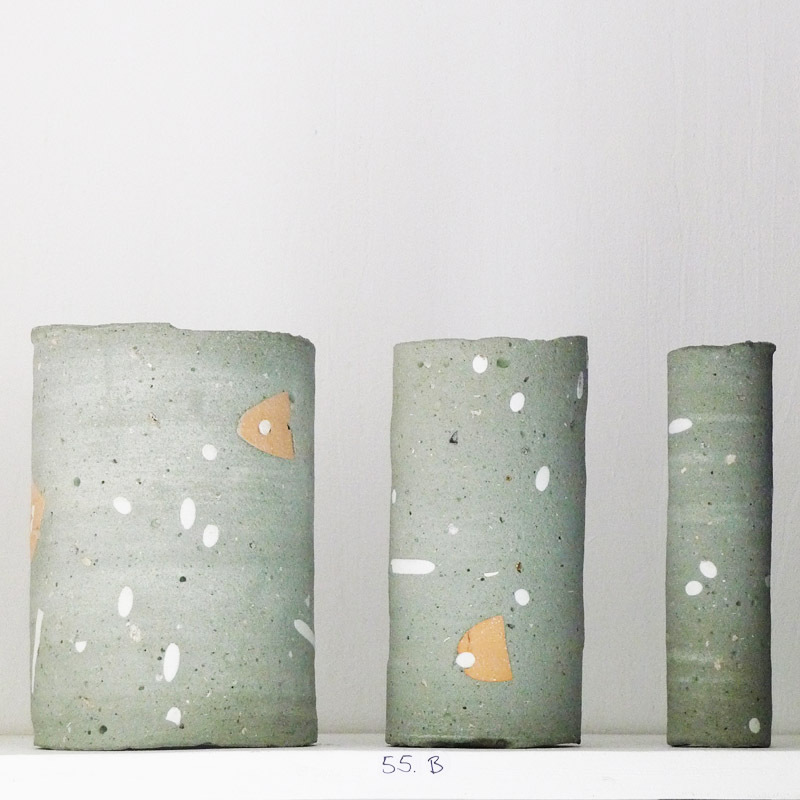 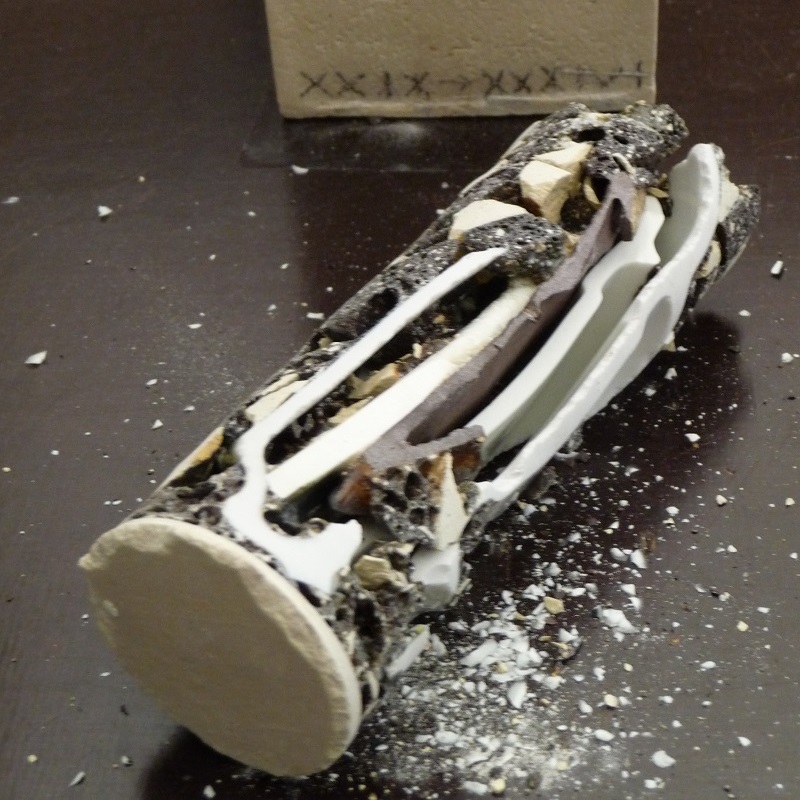 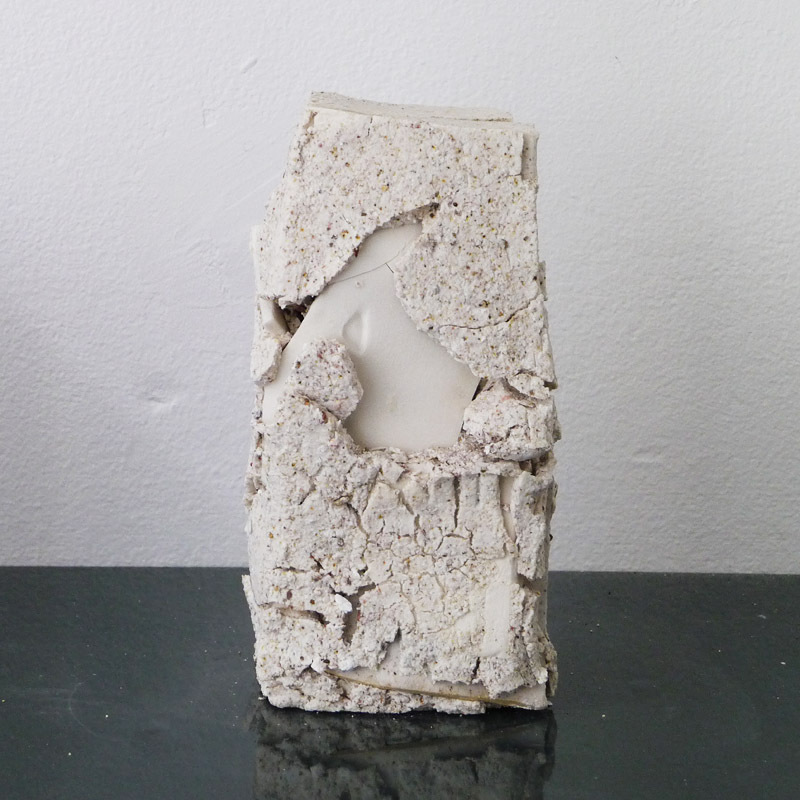 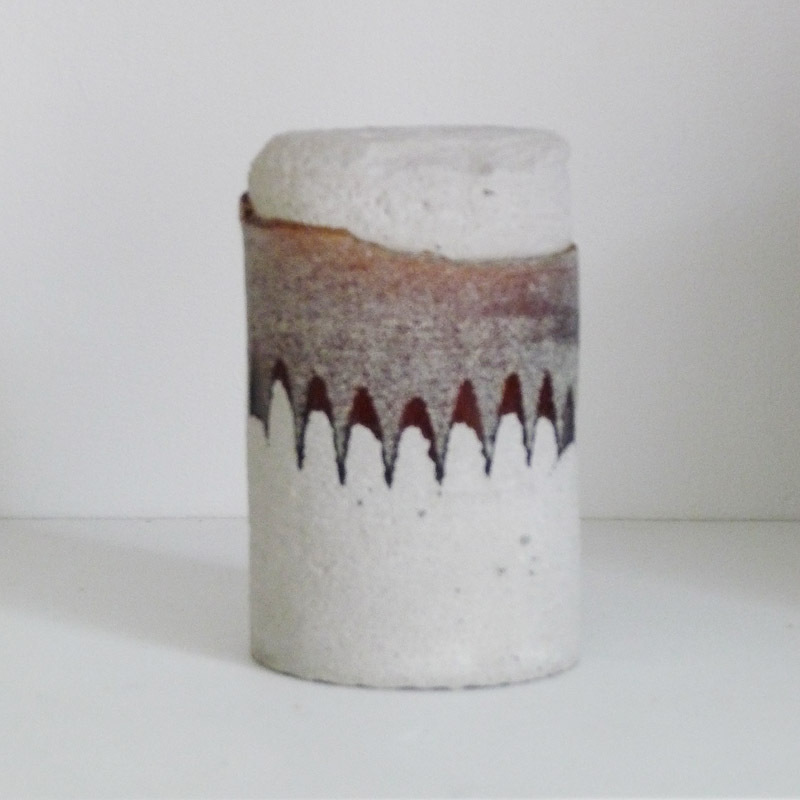 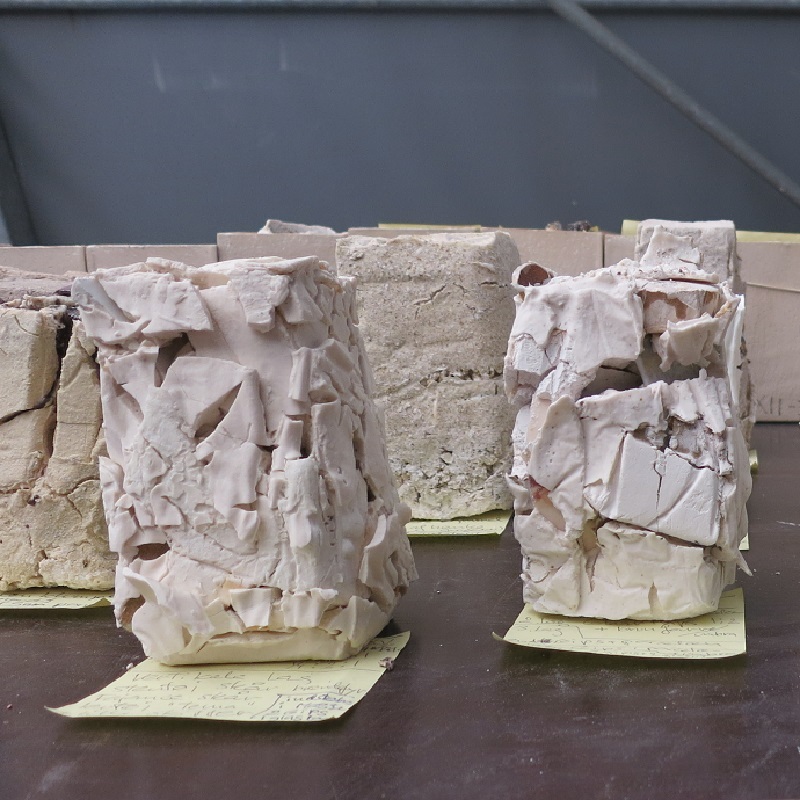 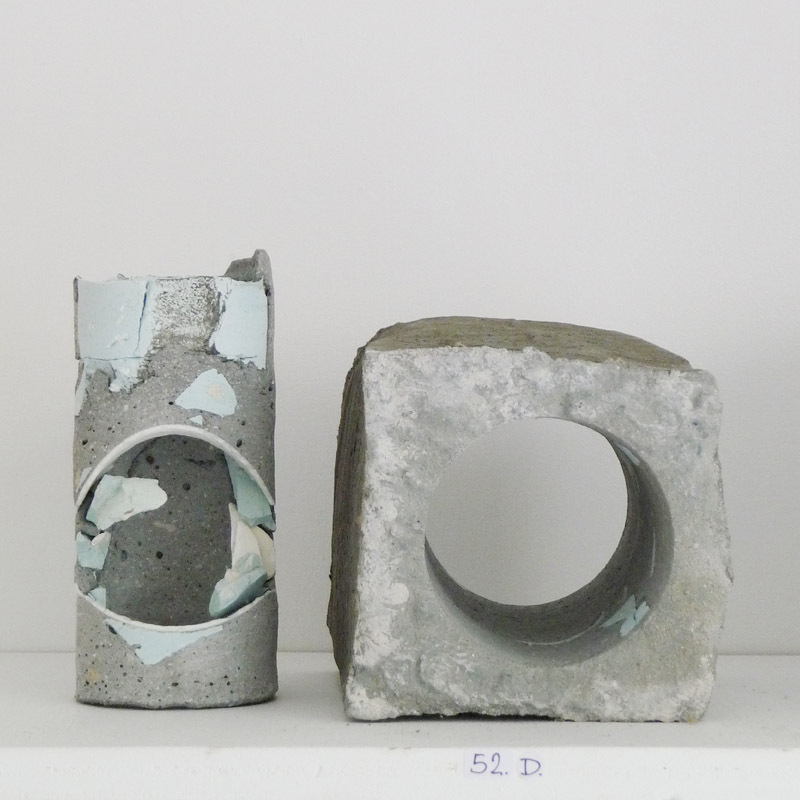 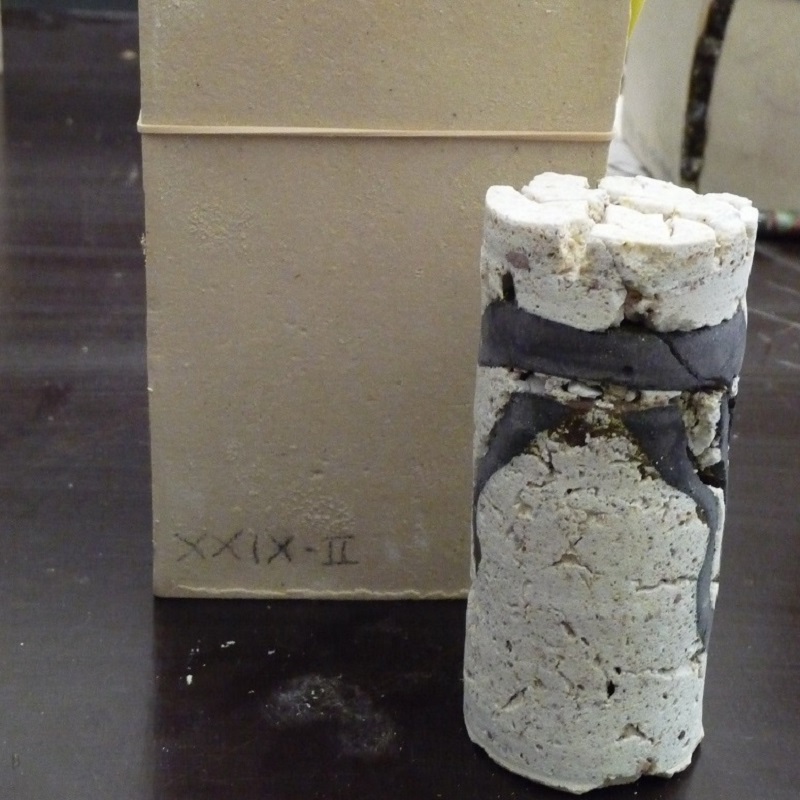 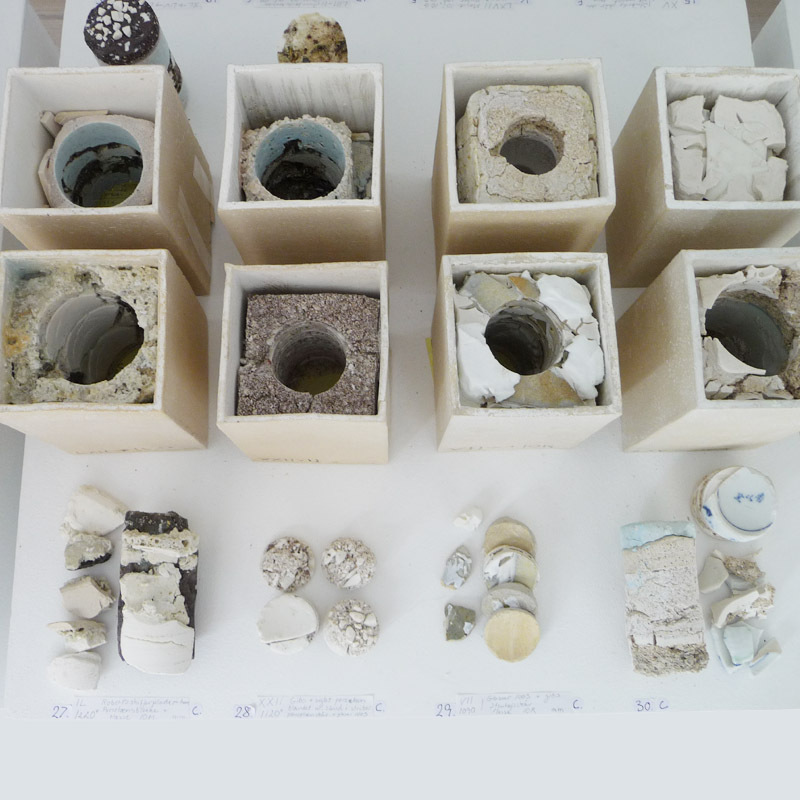 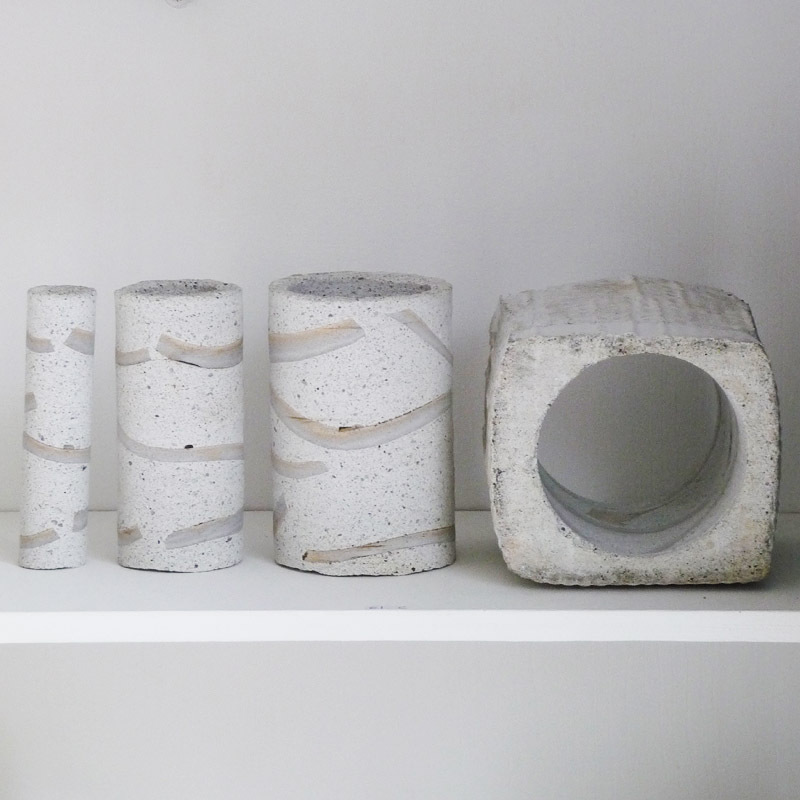 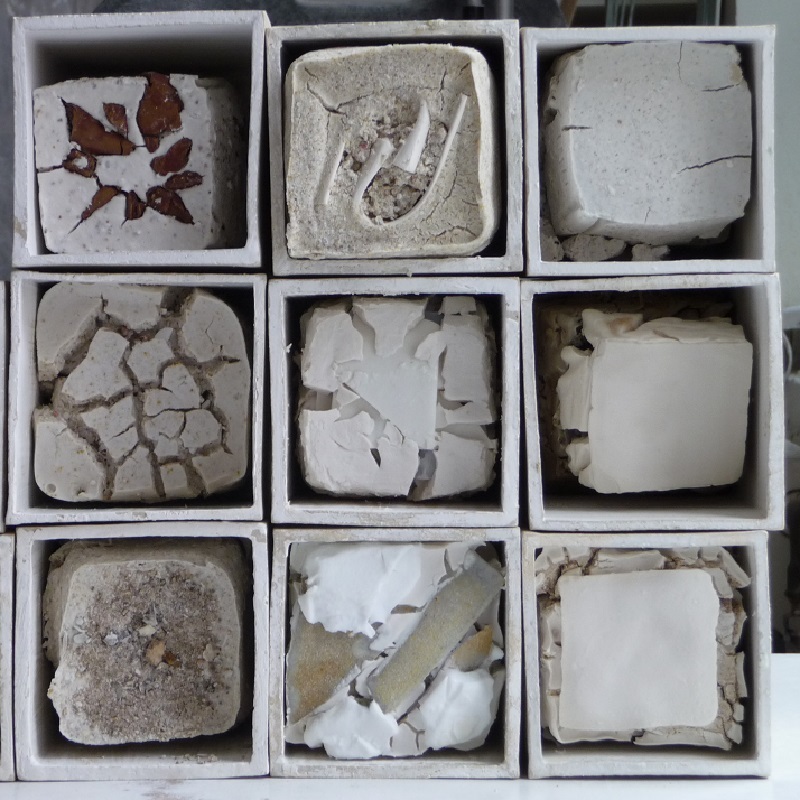 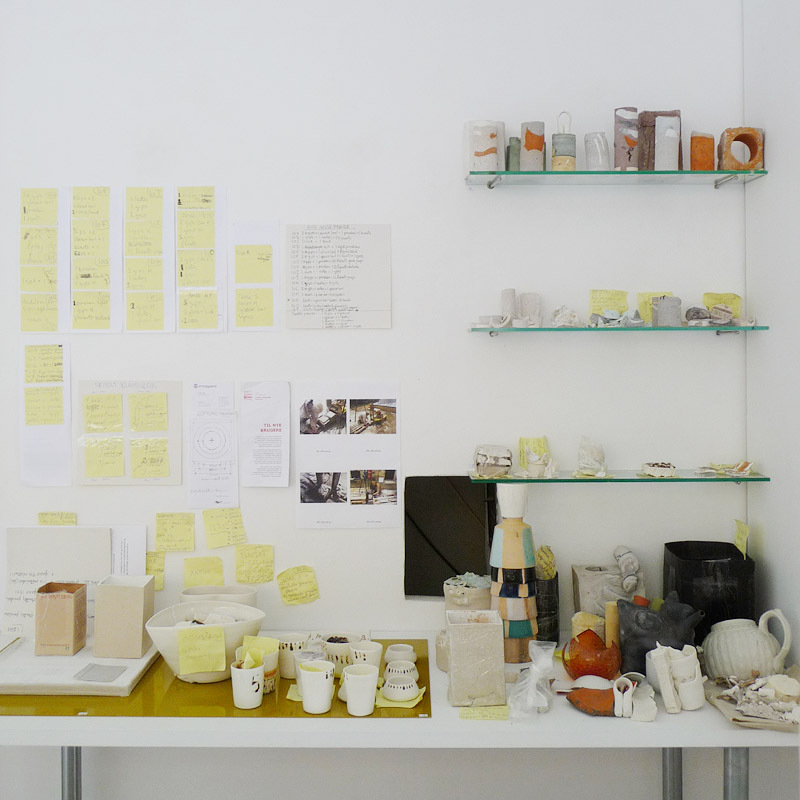 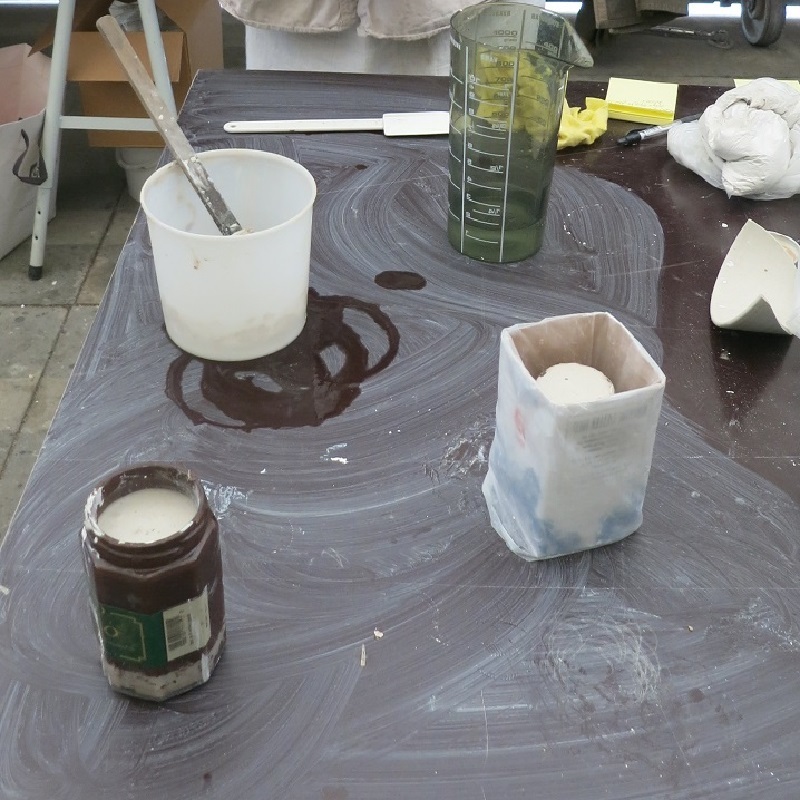 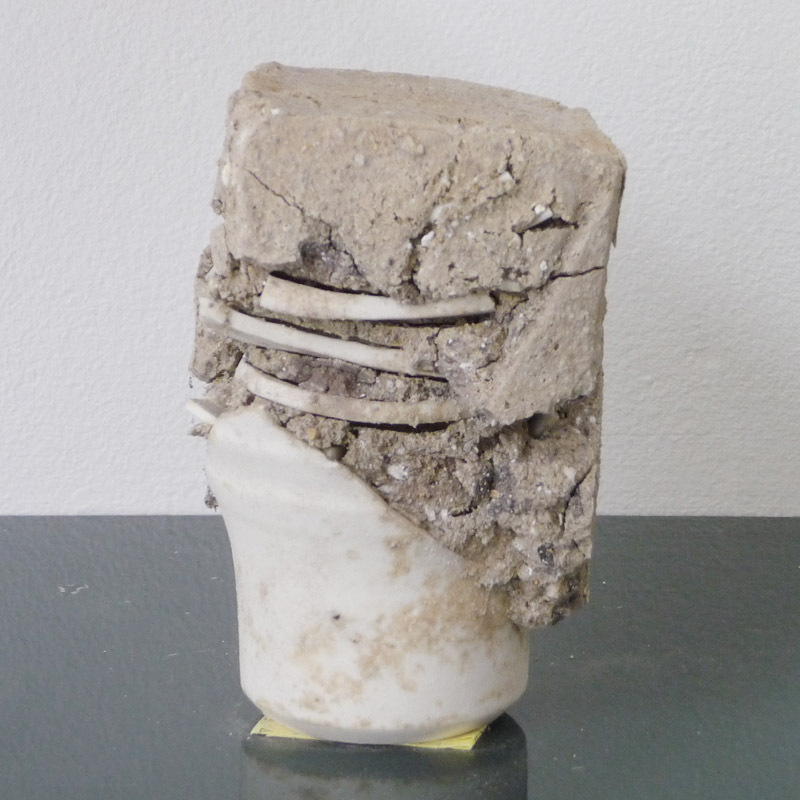 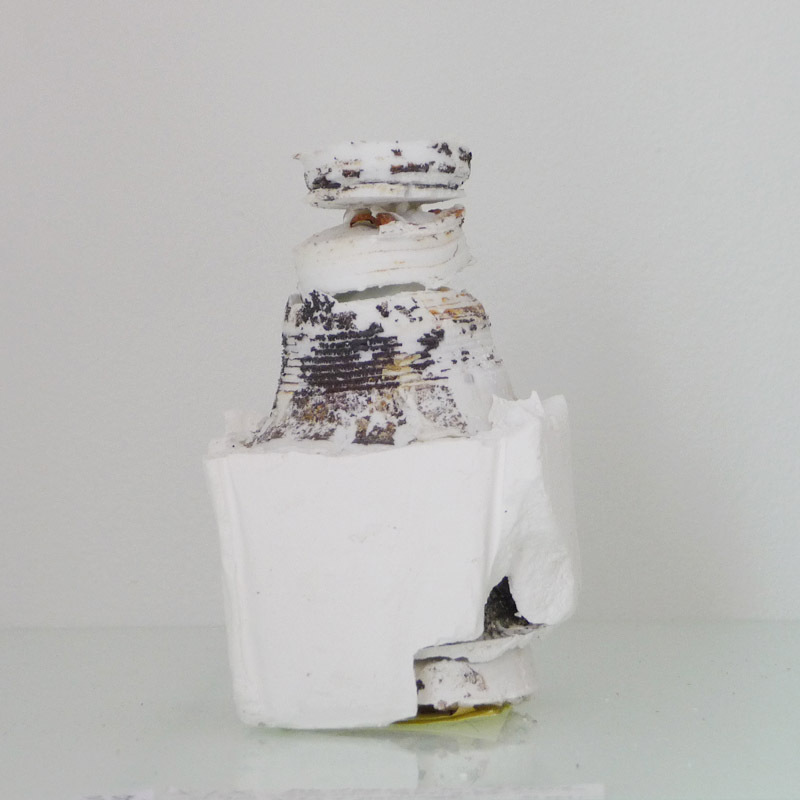 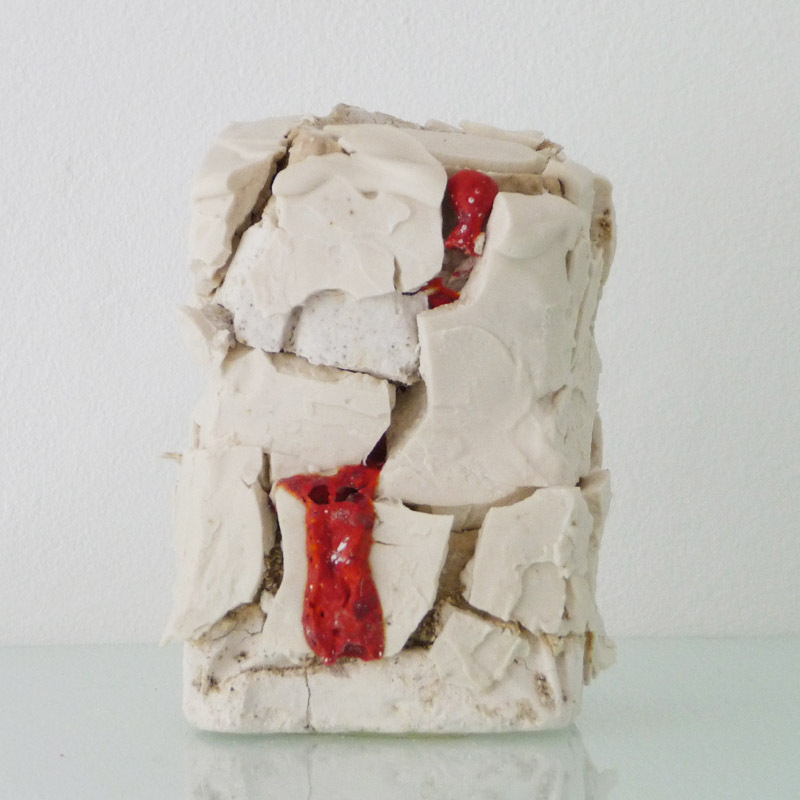 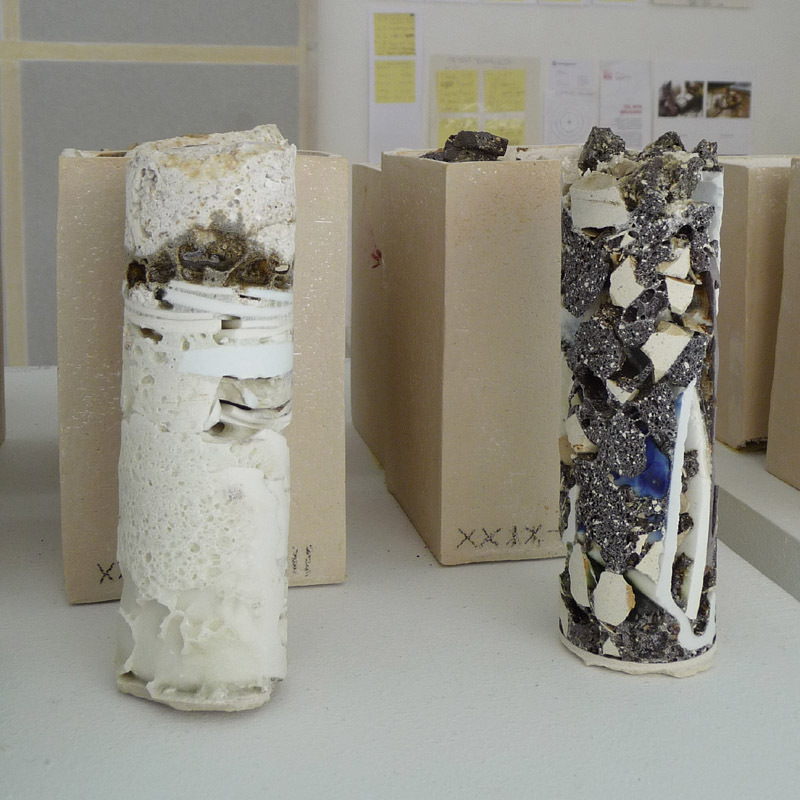 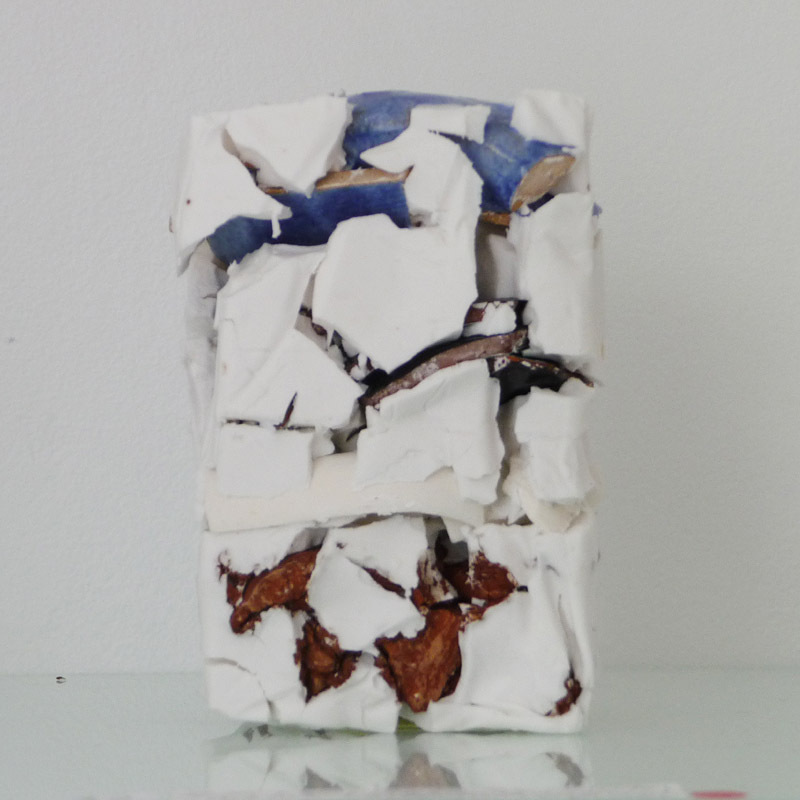 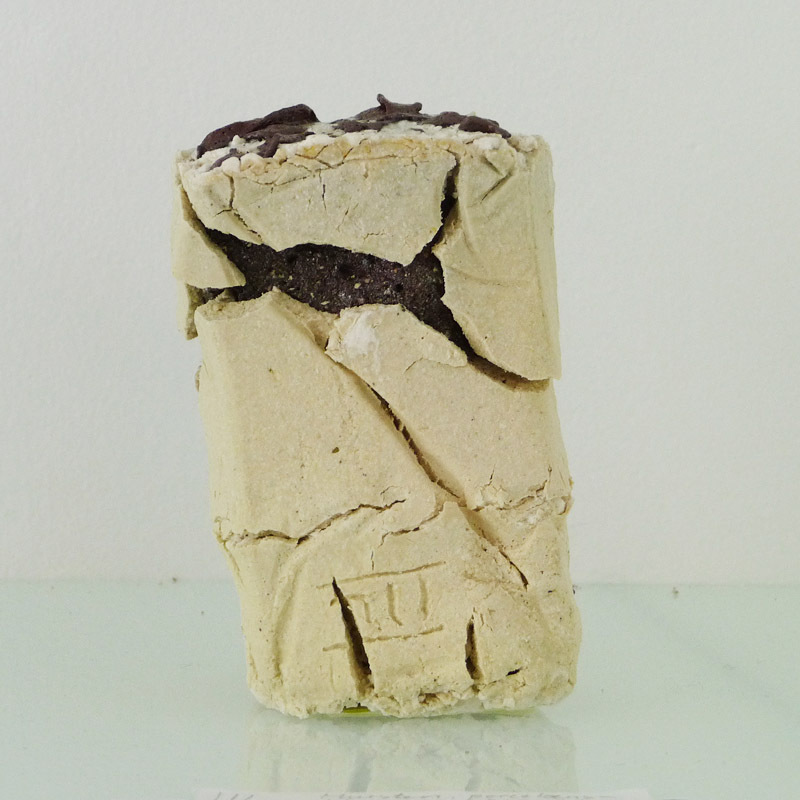 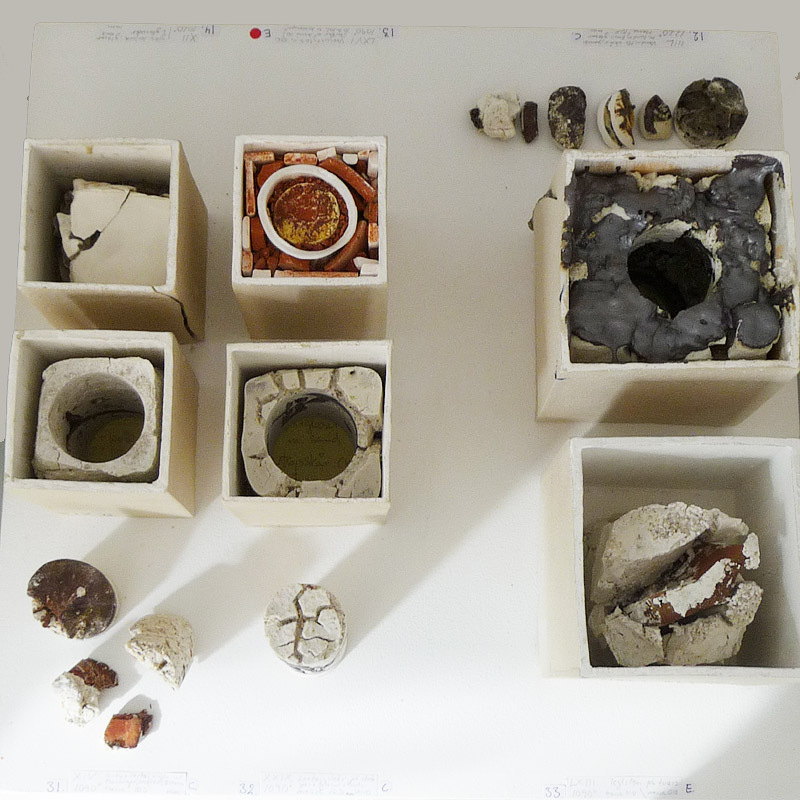 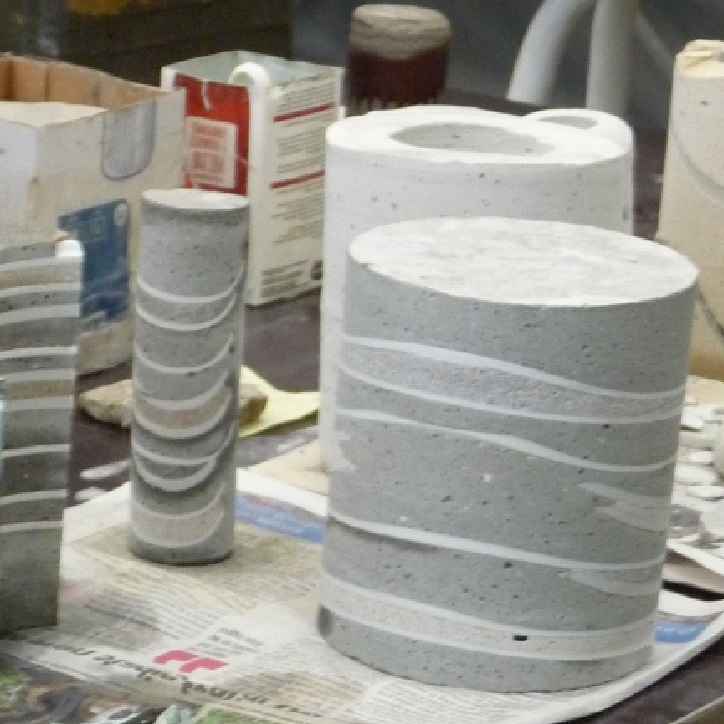 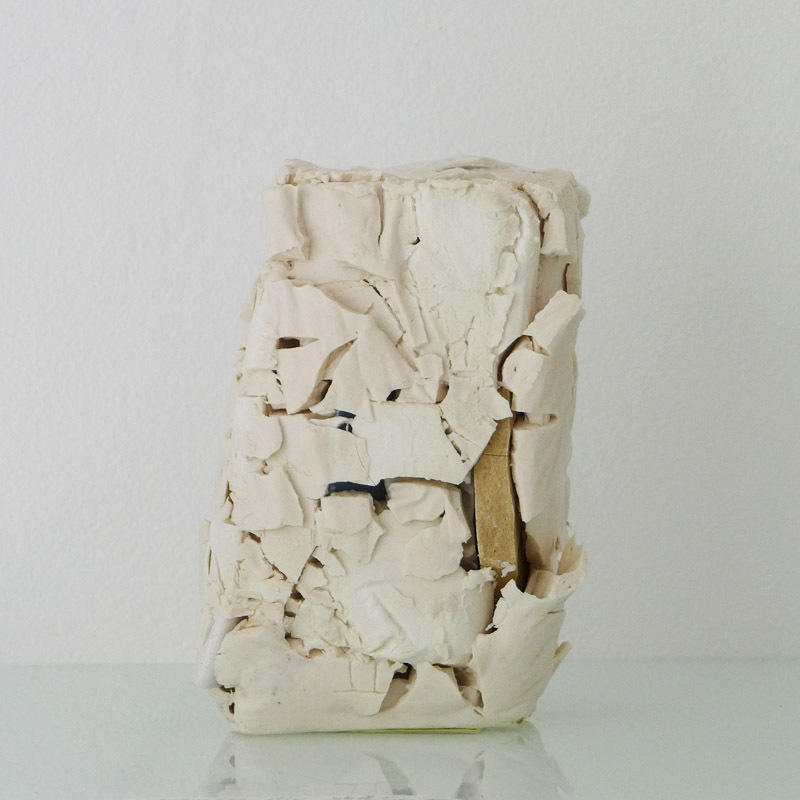 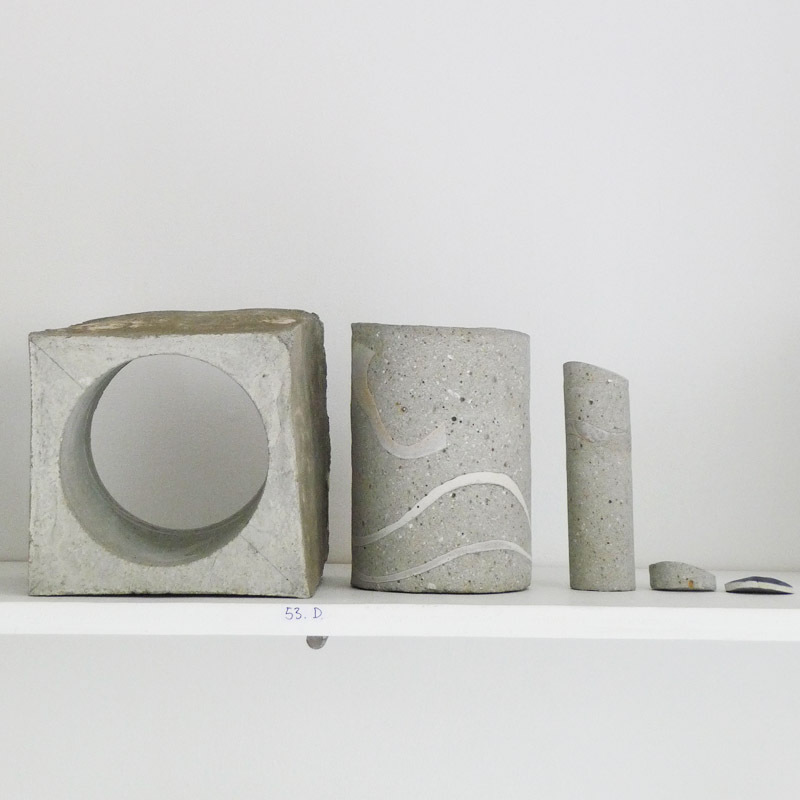 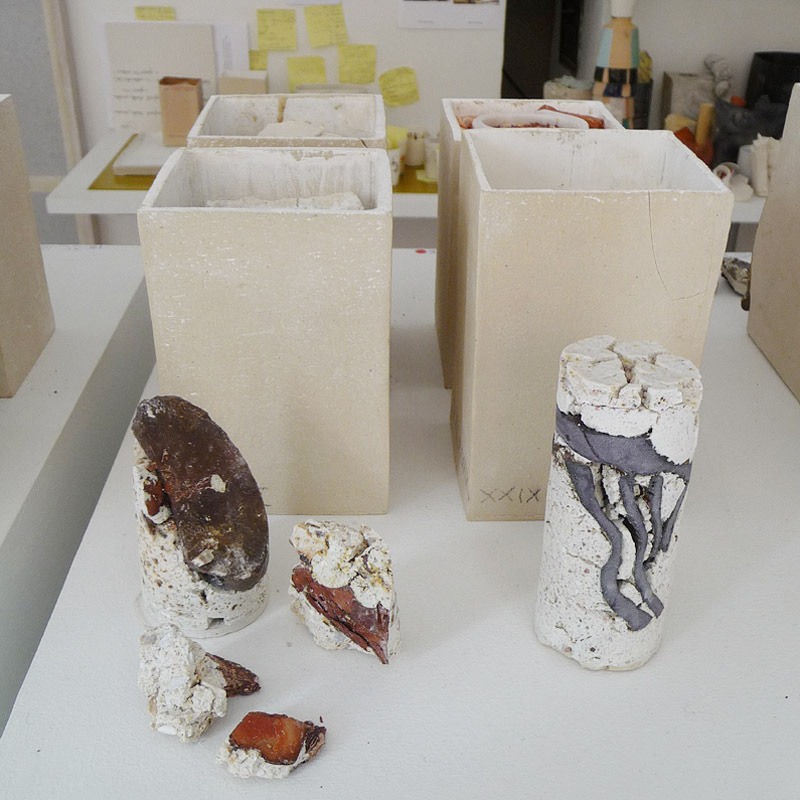 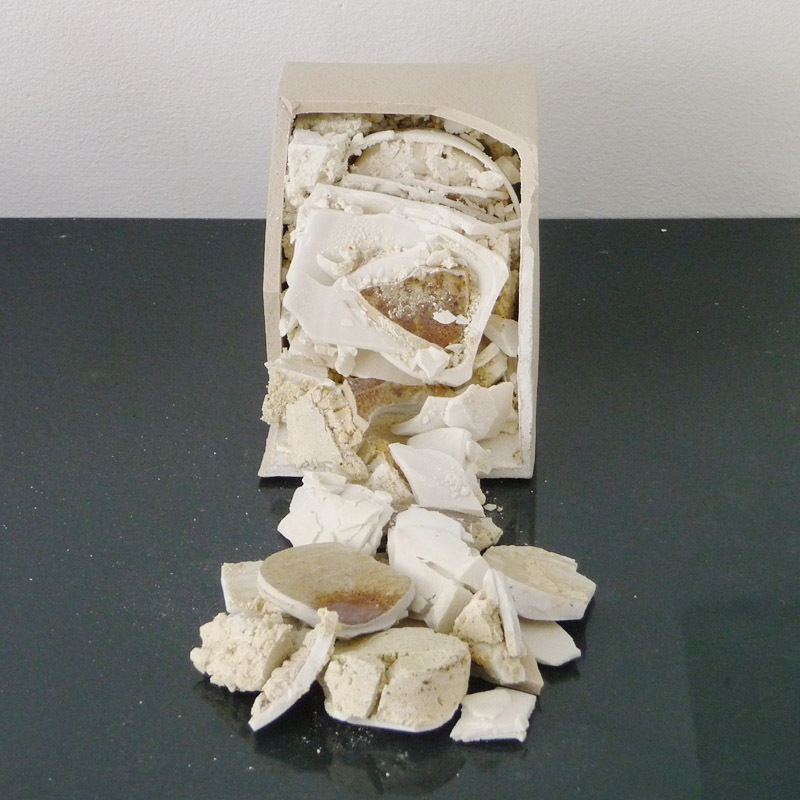 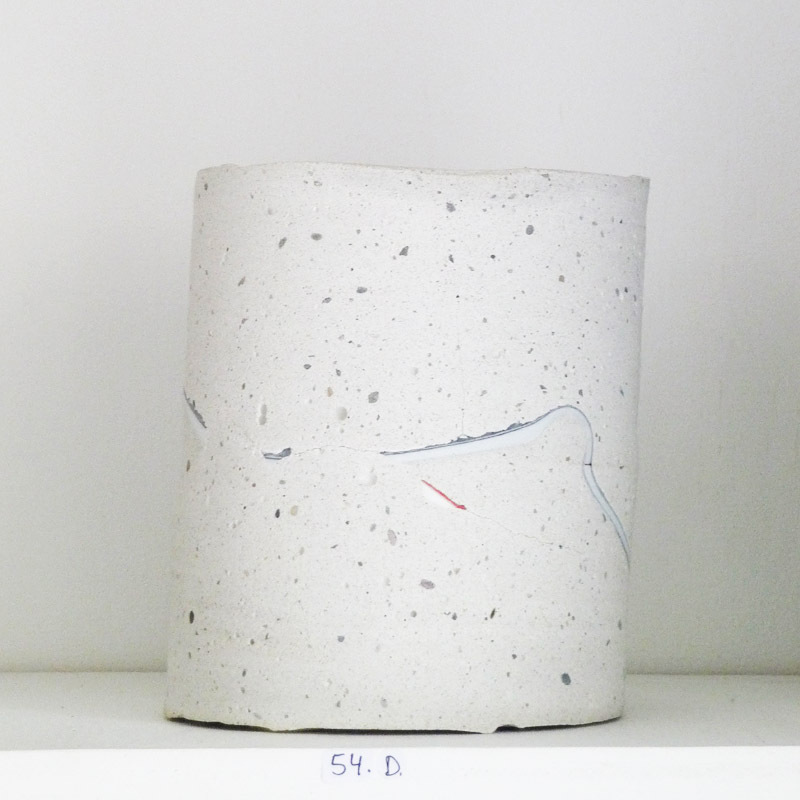 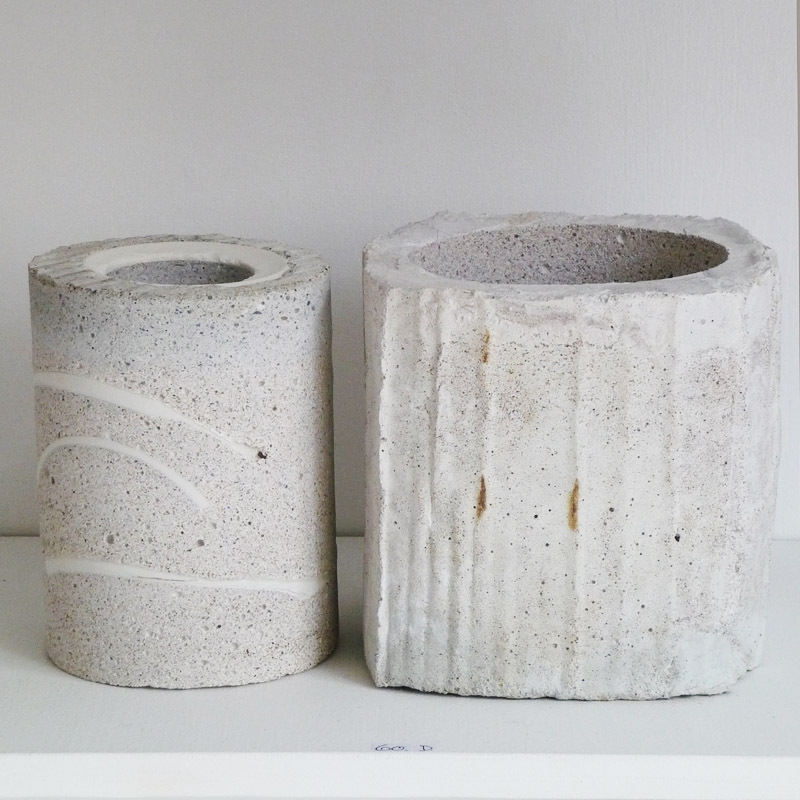 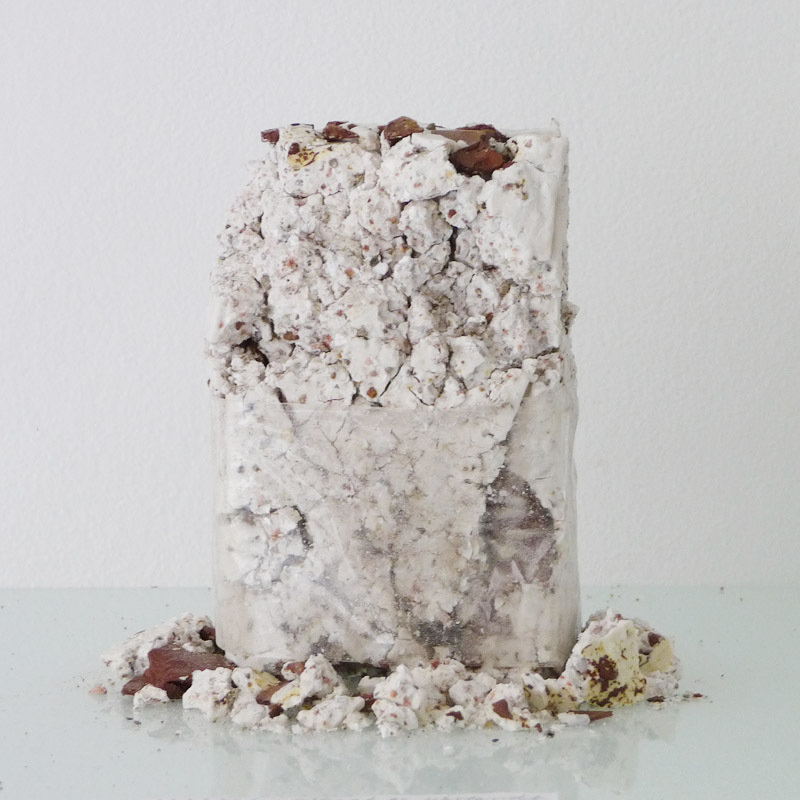 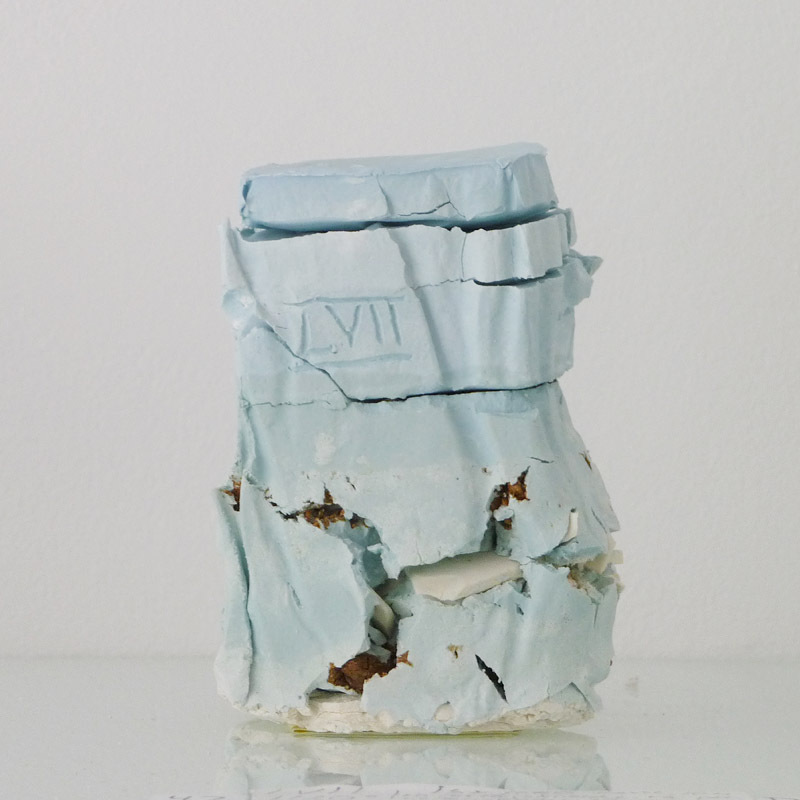 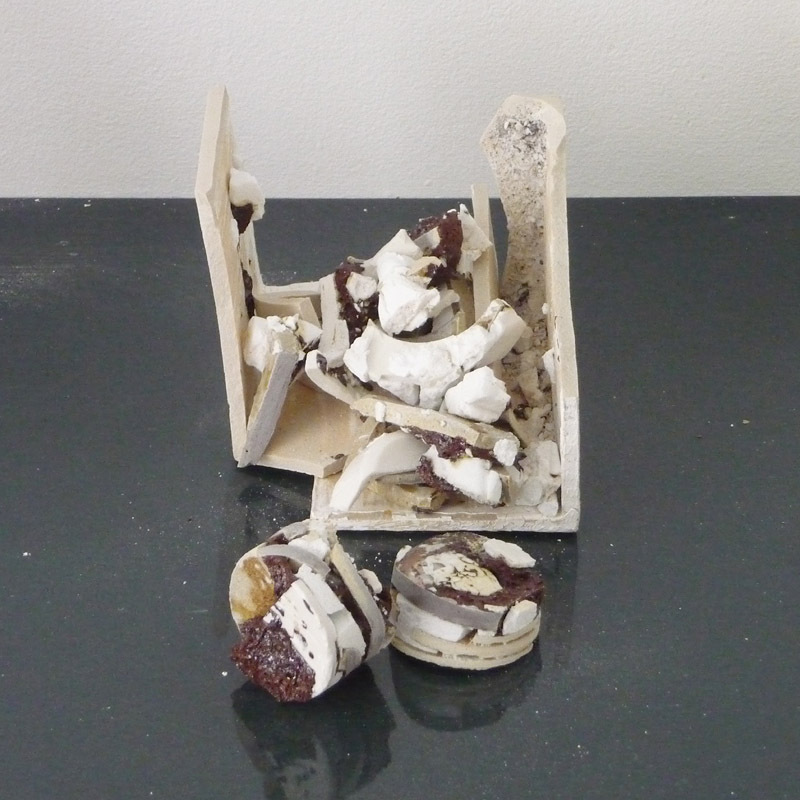 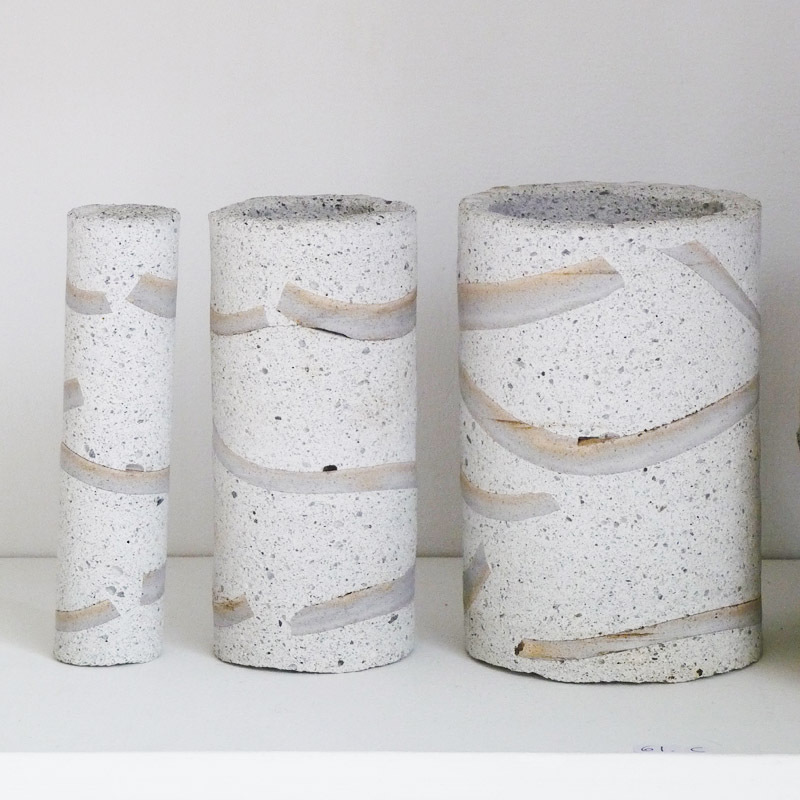 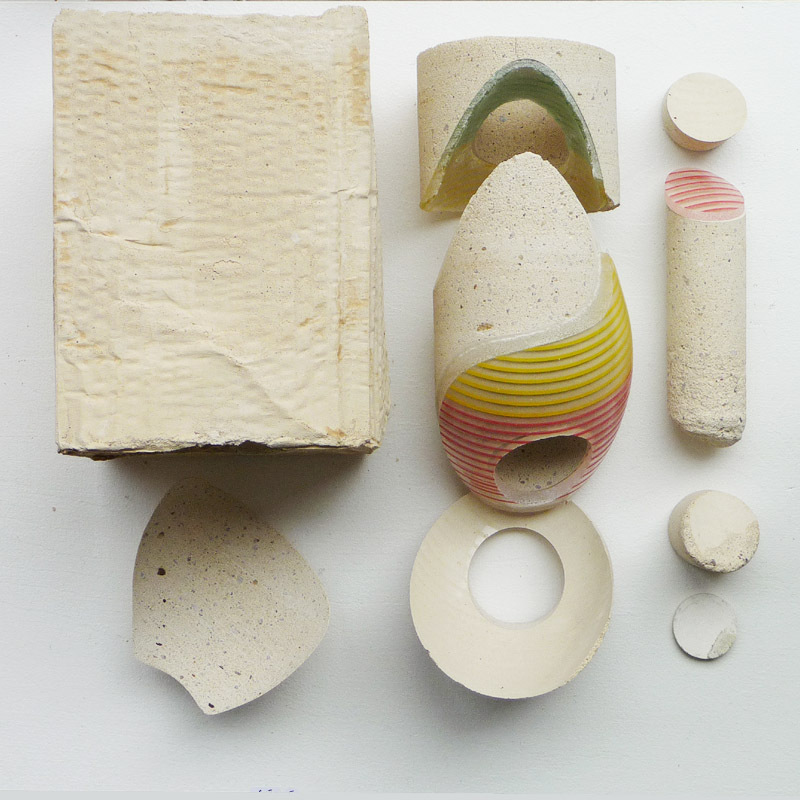 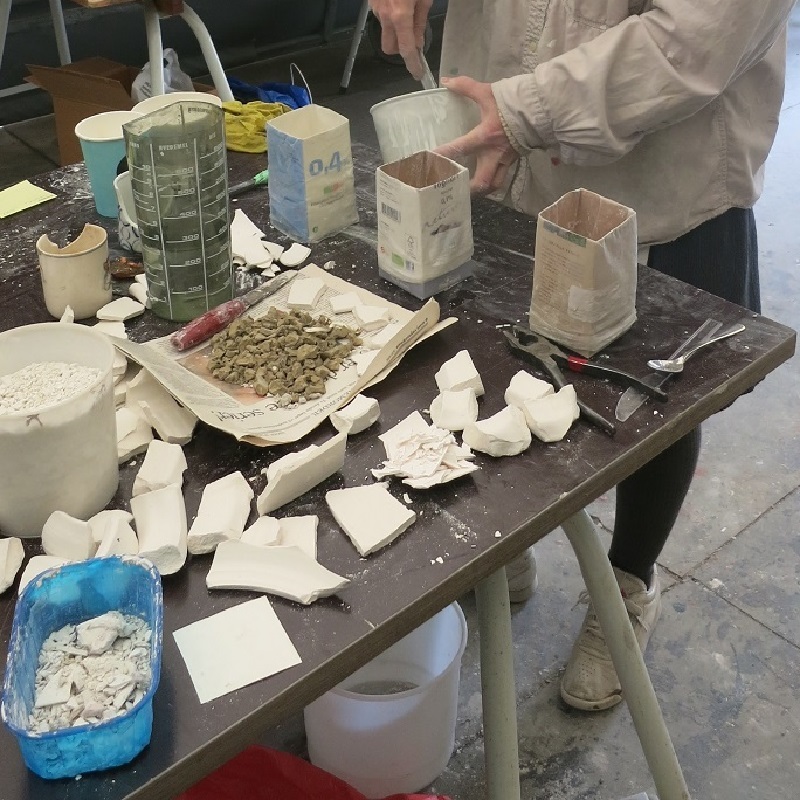 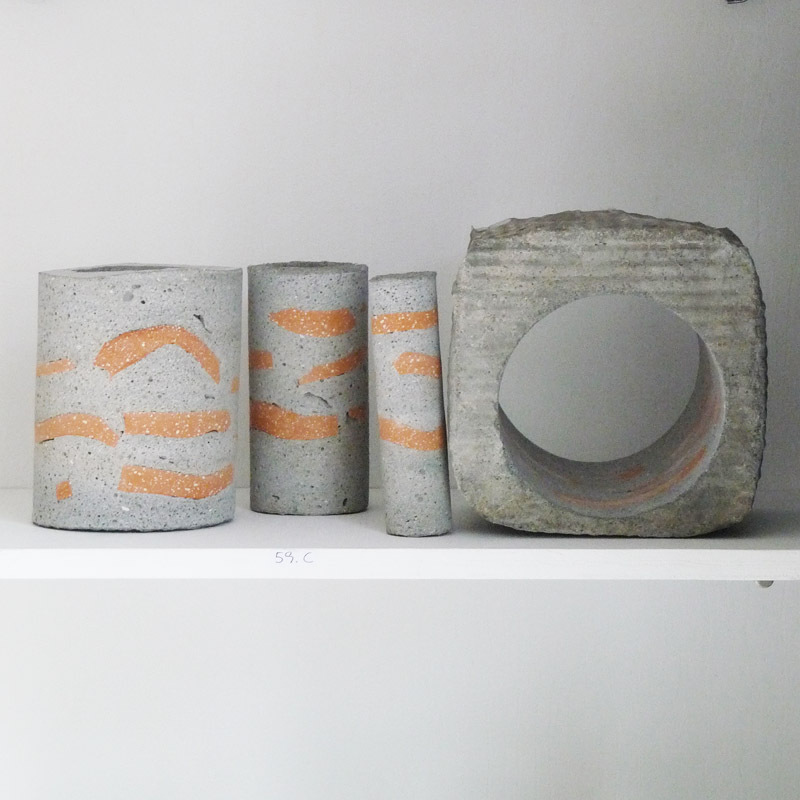 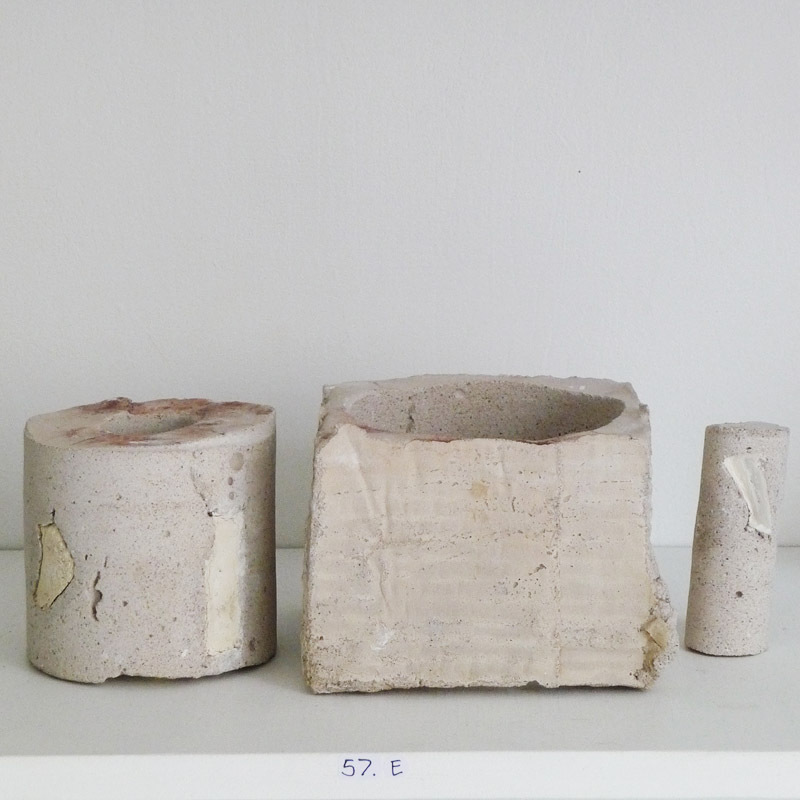 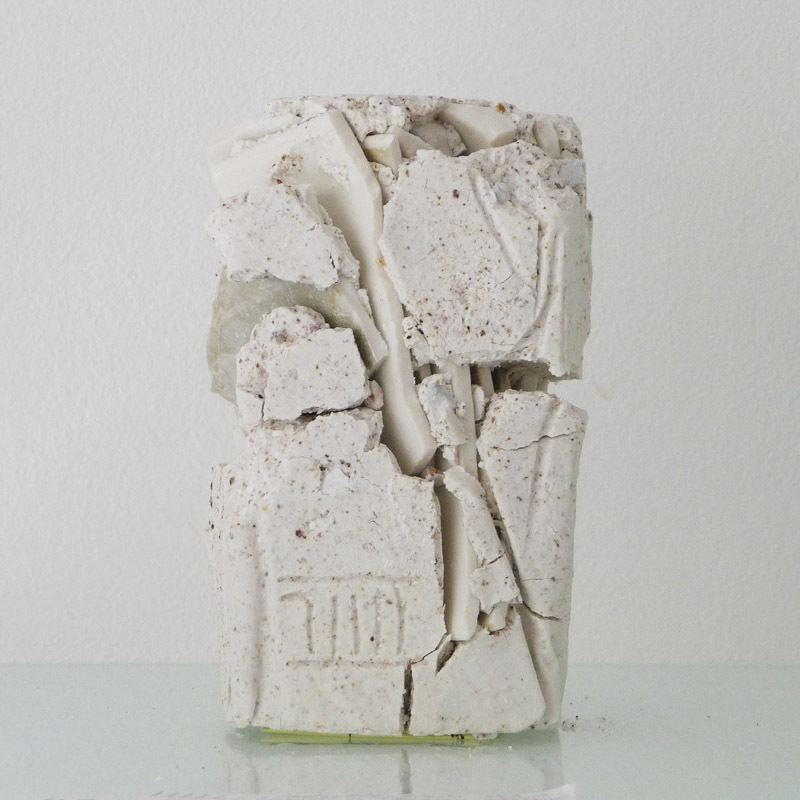 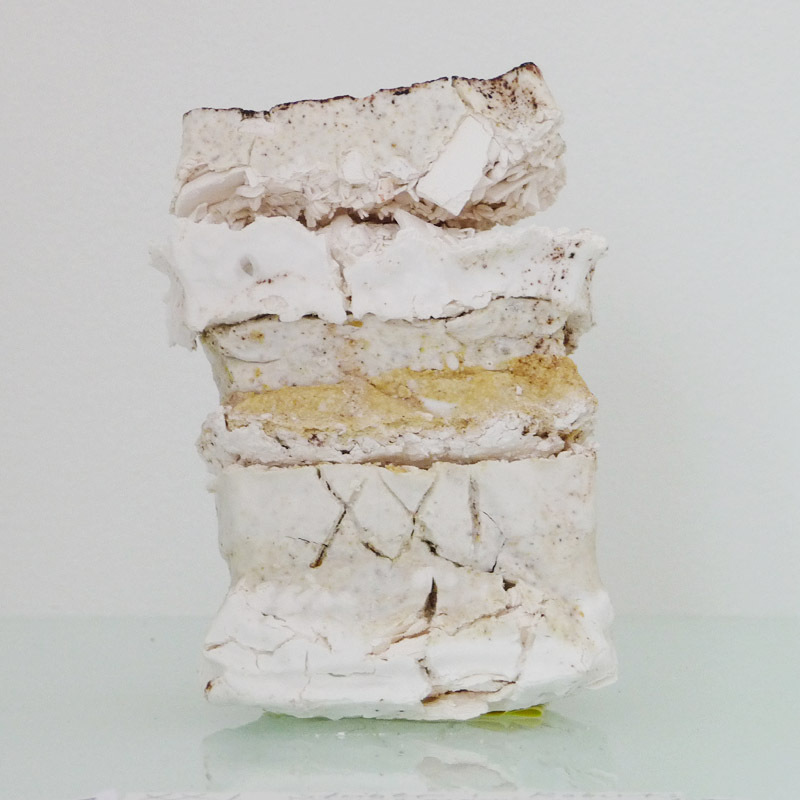 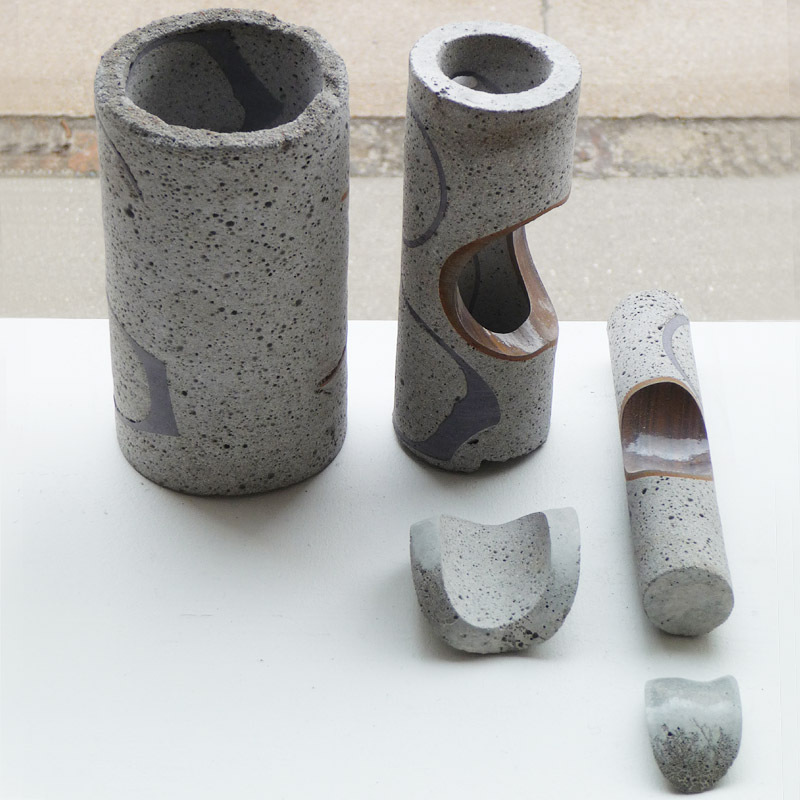 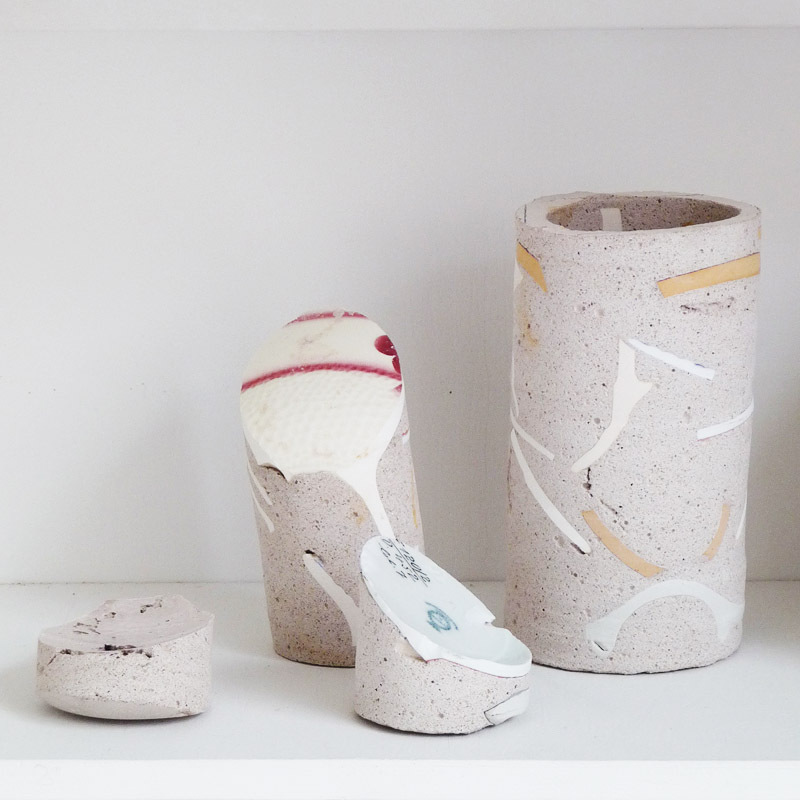 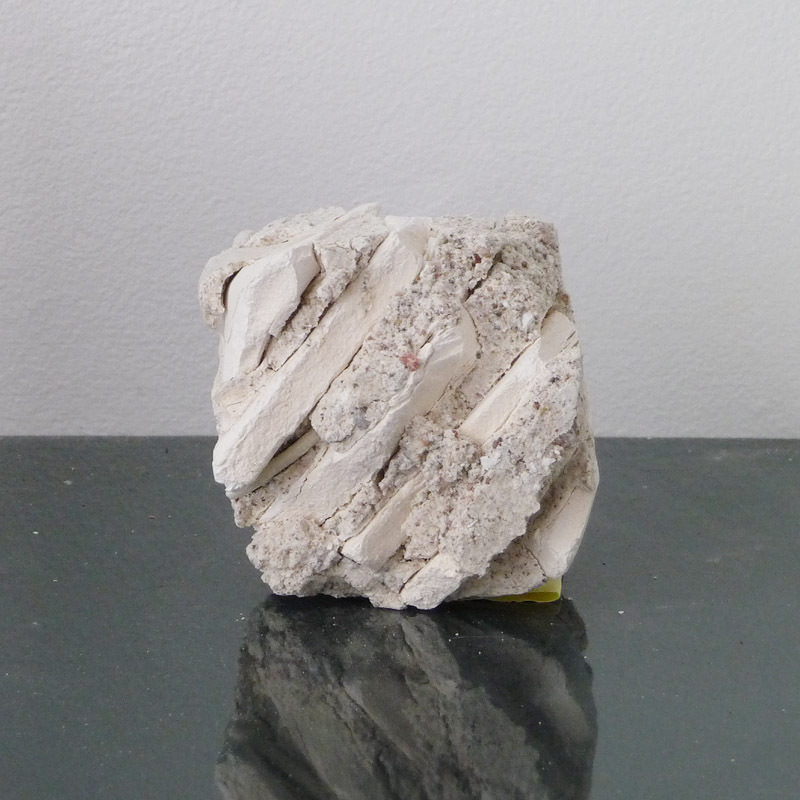 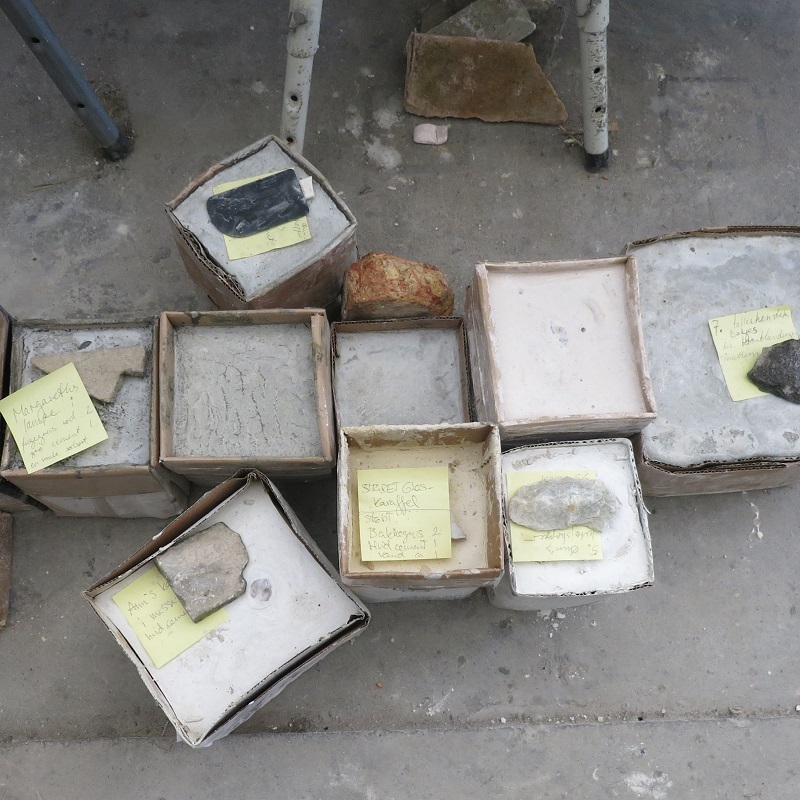 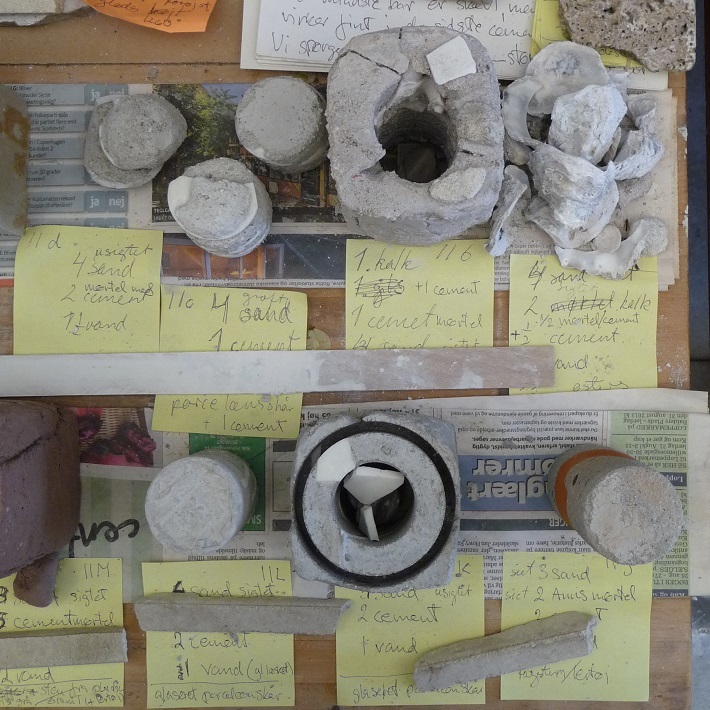 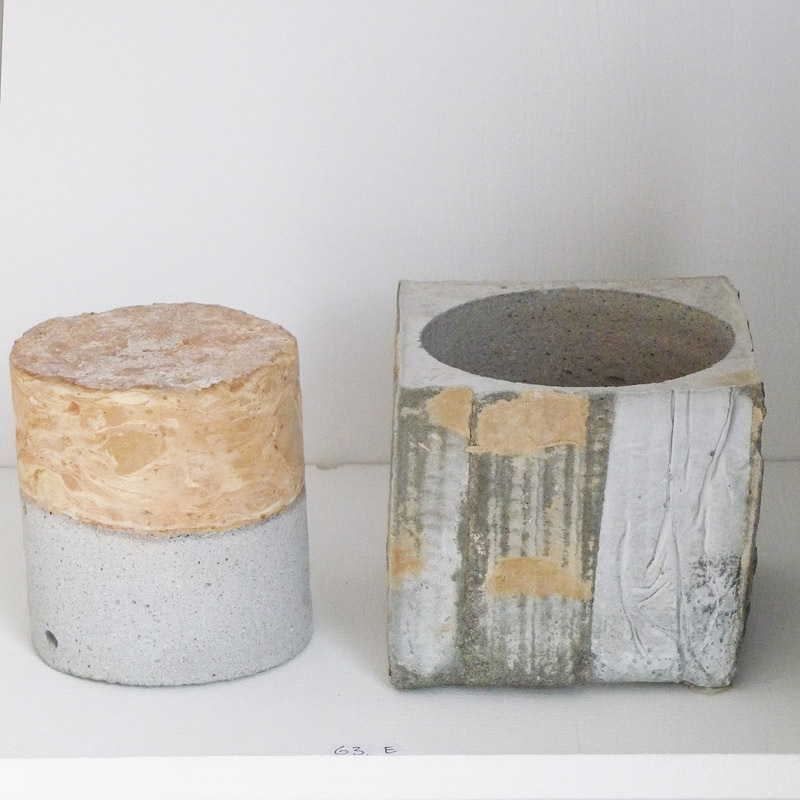 An interdisciplinary experimental collaborative project of material combinations and techniques, such as cylinder-drilling in cast concrete, glaze, clay.. made in a studio residency at The Danish Art Workshops SVFK Copenhagen in 2015. 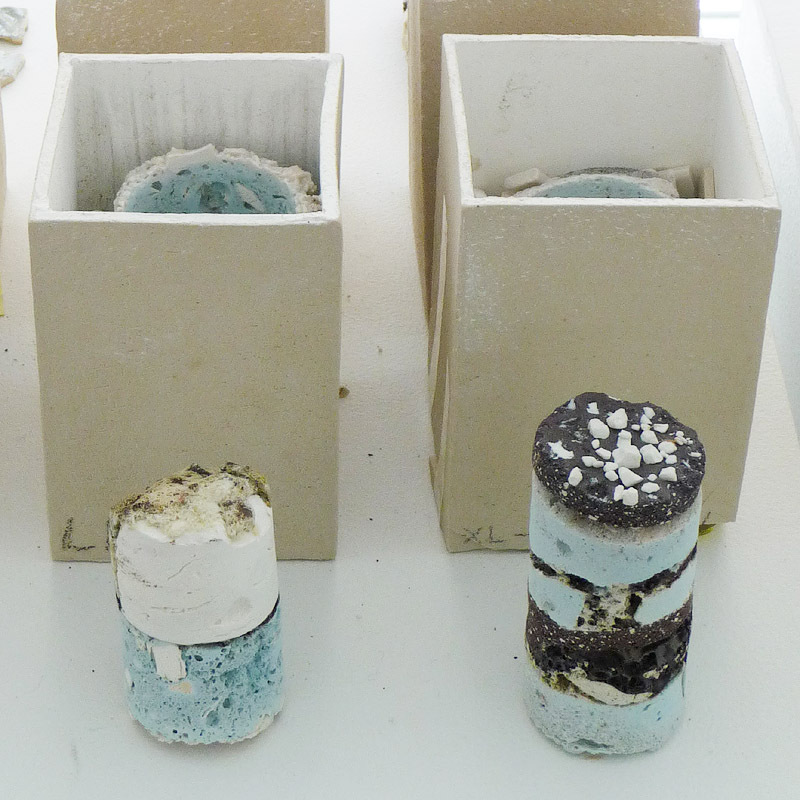 The exhibition was a presentation of the project, showing the laboratory-like character of the experiments and work in progress. 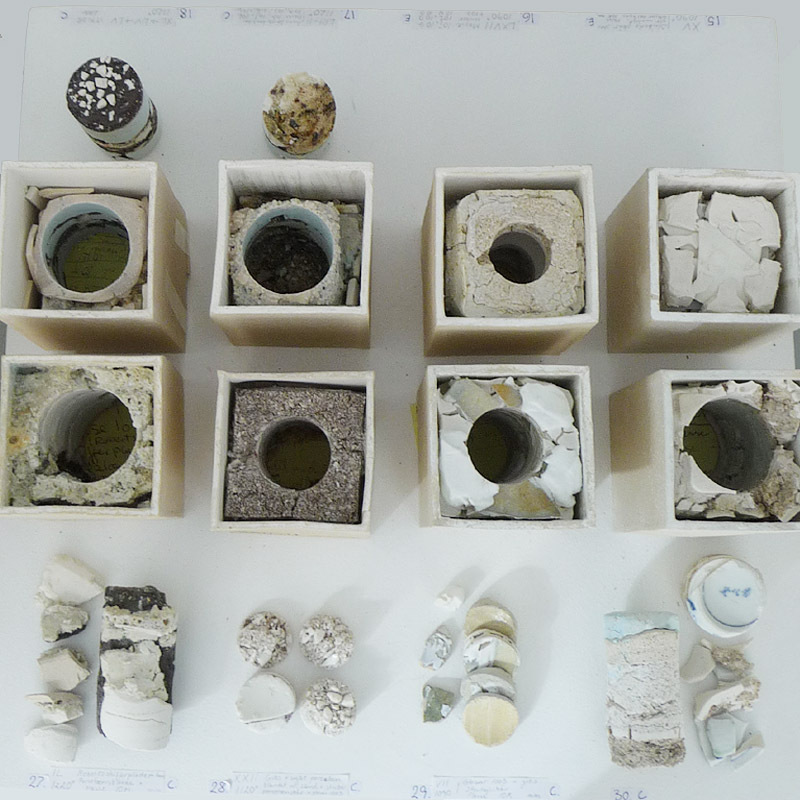 A fascination with secret layers, geological research and collecting things has resulted in a collaboration in which sand, cement, old shards, cups and other easily available materials are cast and/or melted into unique small existences, which are core-drilled, and archaeological surprises have emerged. 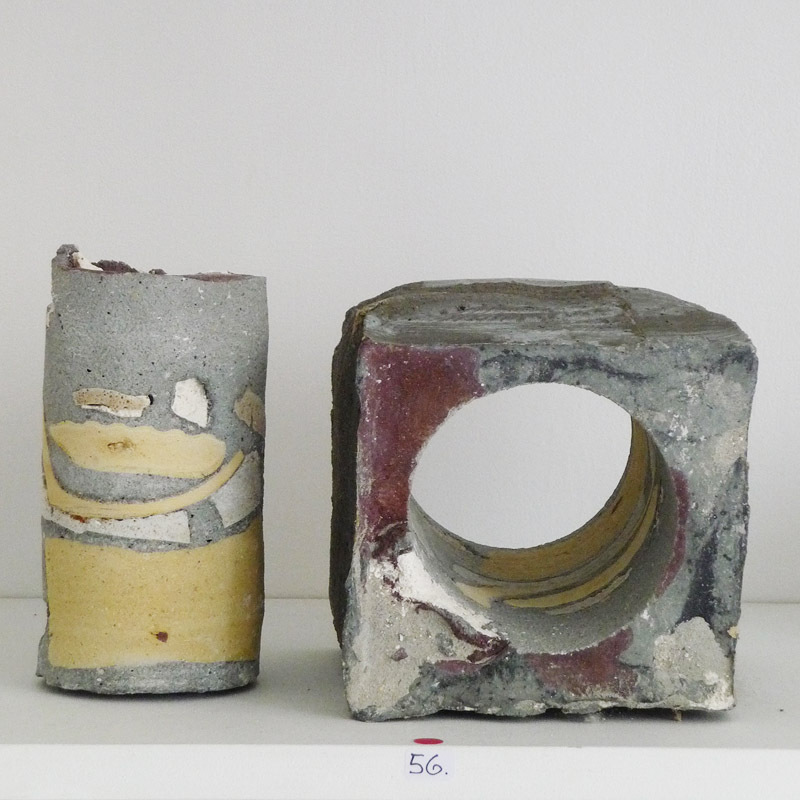 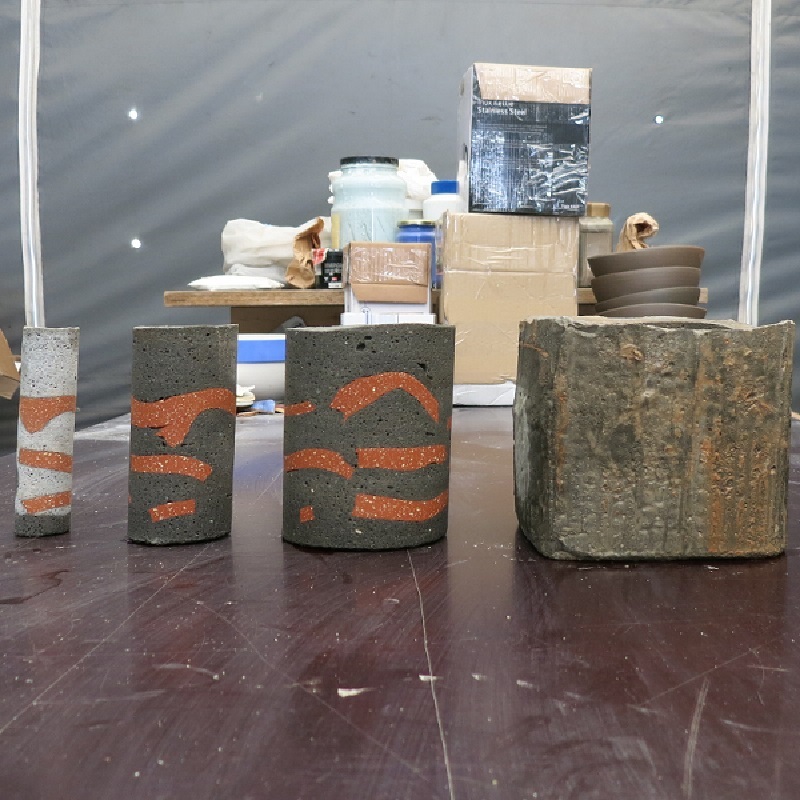 Cup-drilled columns, some are several cuts out of one casting, creating new spatialities, as from the recycled teapot that is cast in concrete, to seabed-like associations in the ceramic drillings. 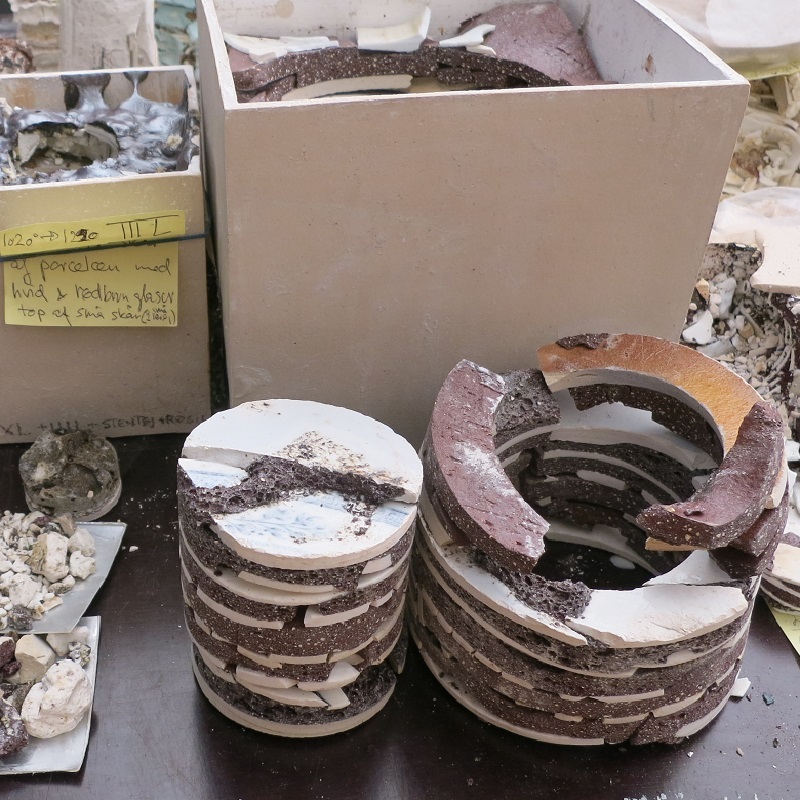 Much fell apart in the process, some fell out reasonably, but small revelations also jumped out of the project. 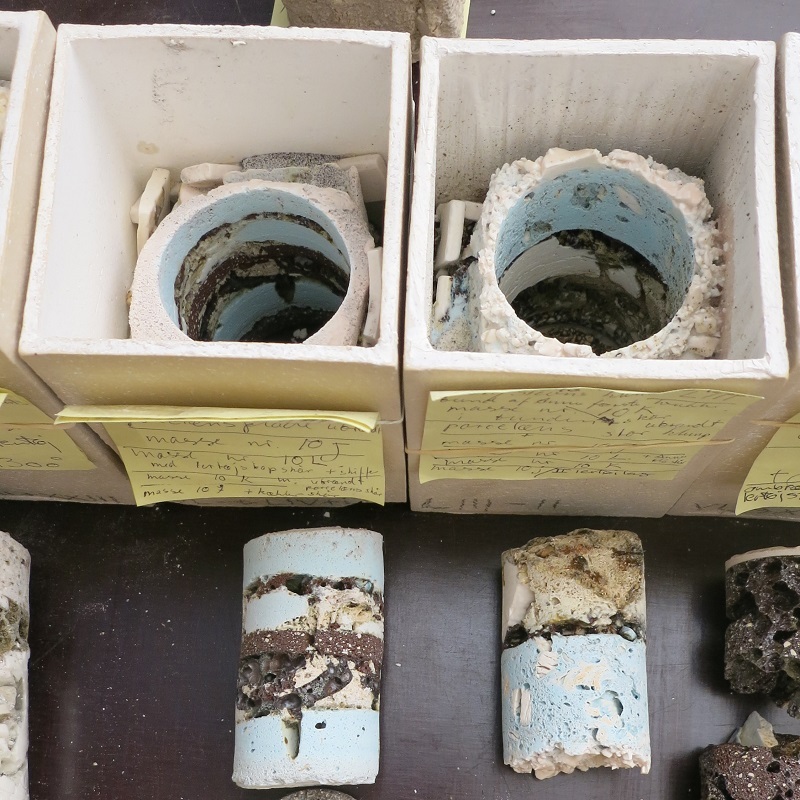 Unpredictable areas and substances, also much stuff in the bottom of a bucket. 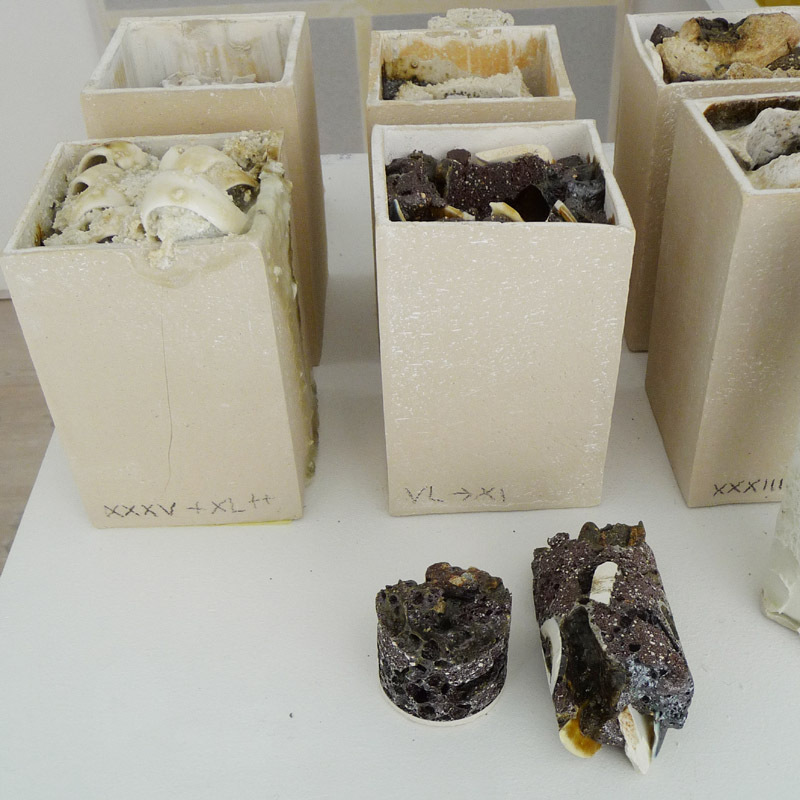 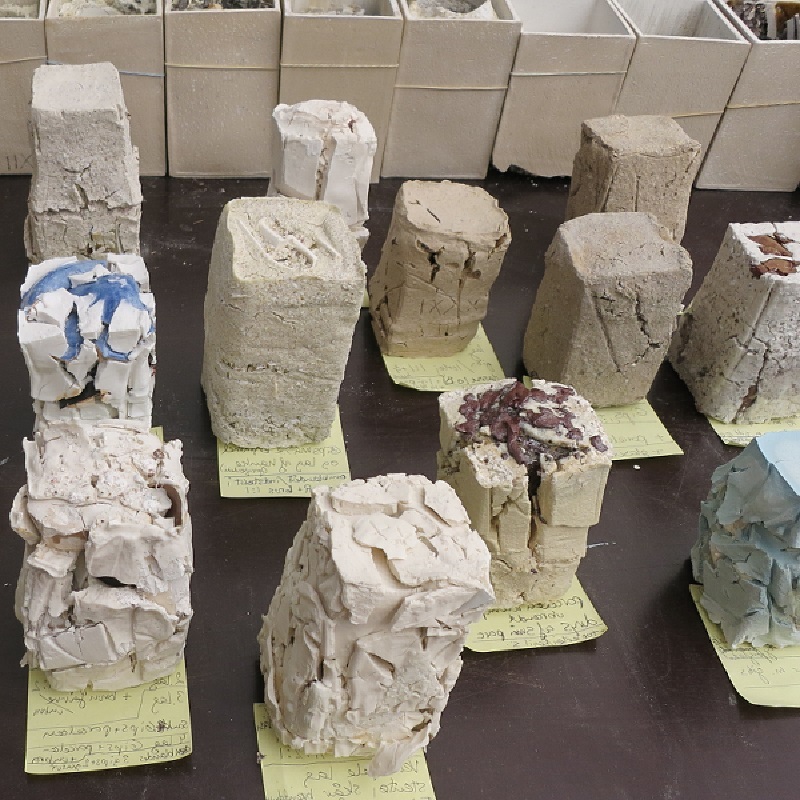 Some casts are in a geological-like state as if extracted from the real world. 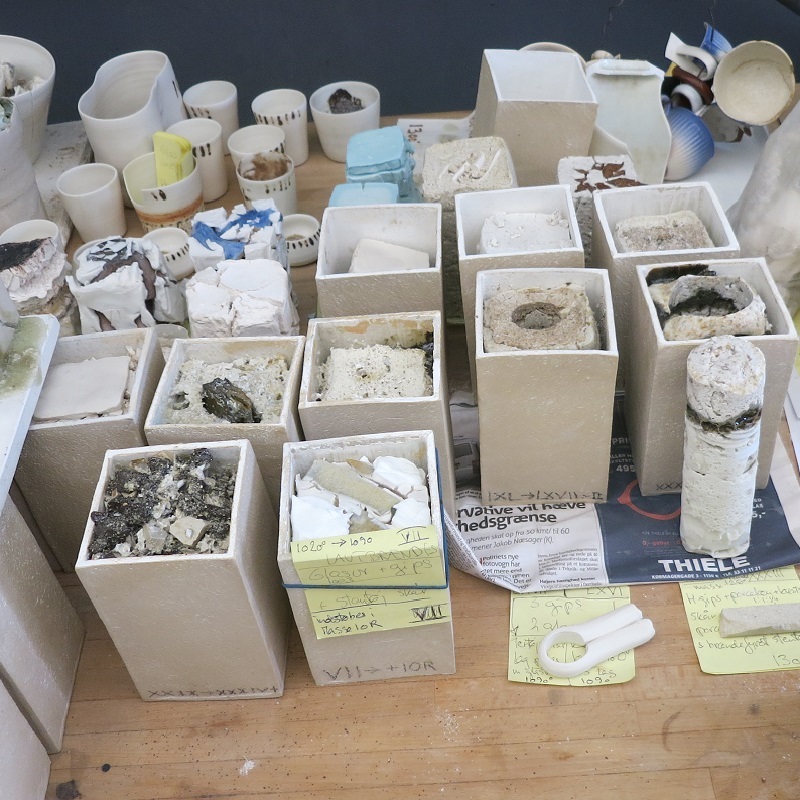 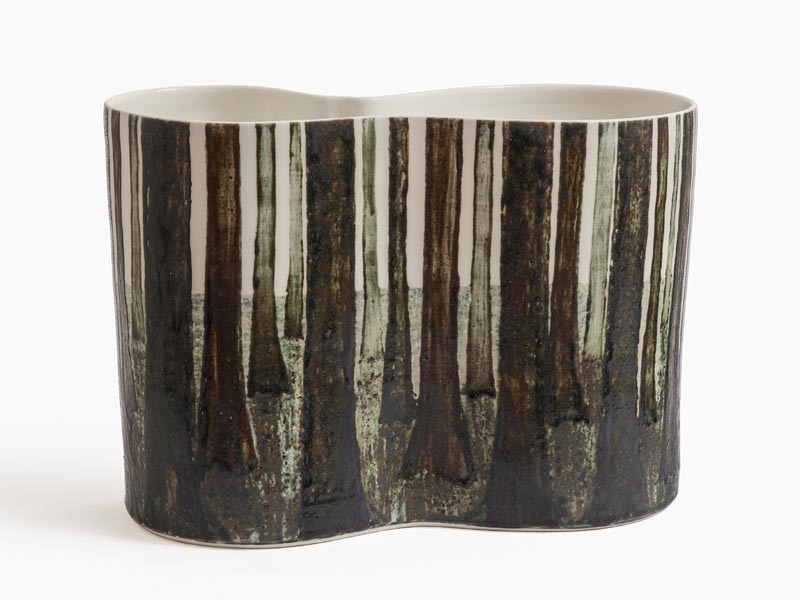 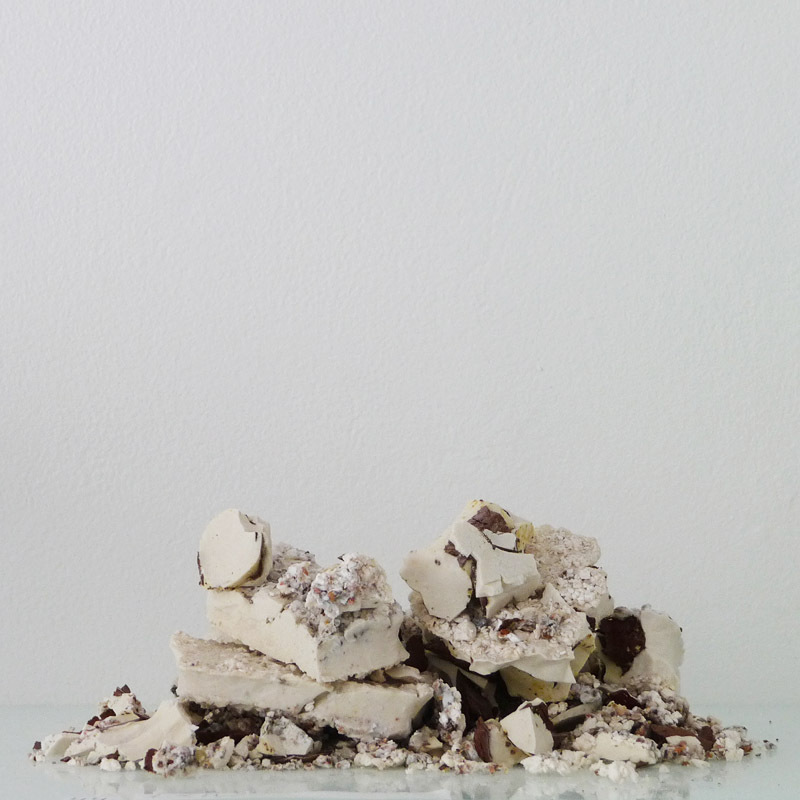 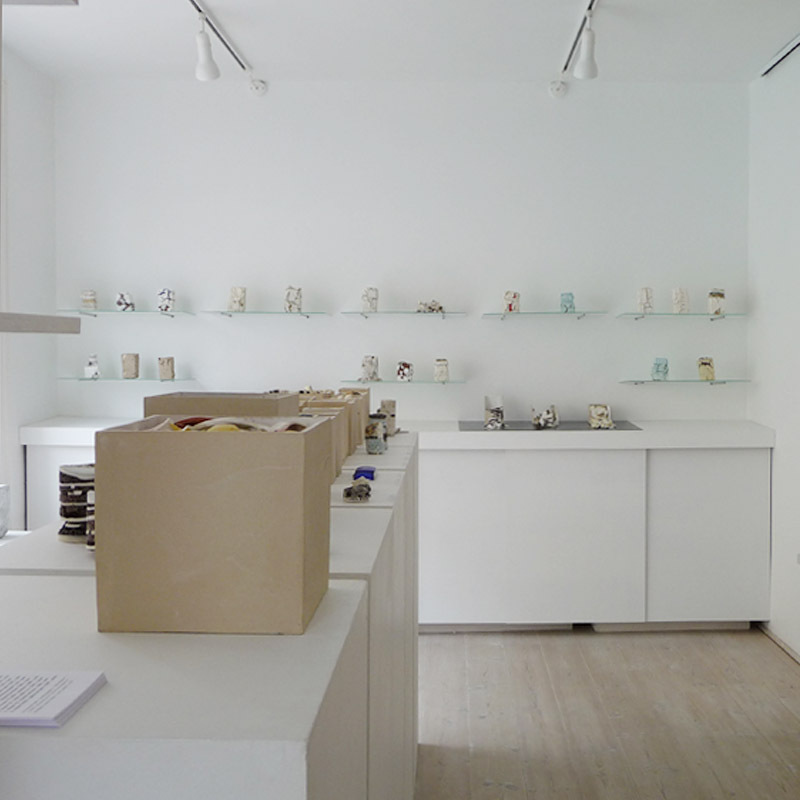 The project used gravel, various powders, metal oxids, glazes, clay, pottery shards, - Ann Linnemann's cups, jugs, bowls and Anne Fabricius Møller's accumulations. 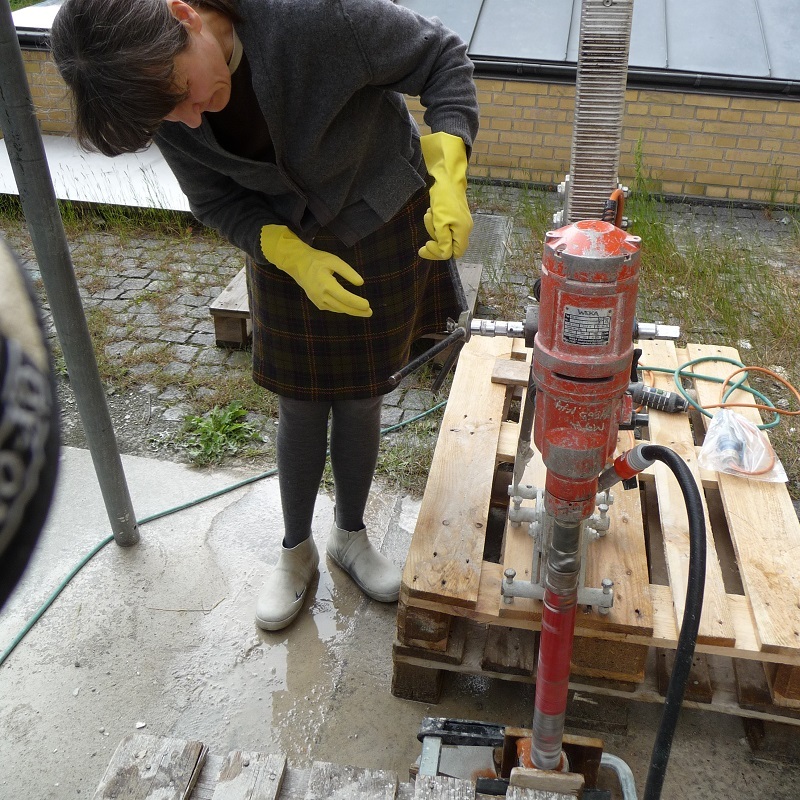 Grateful thanks MT Højgaard for the loan of drilling equipment and The Danish Art Workshops SVFK in Copenhagen for studio space in the spring of 2015.
and to the Danish Arts Foundation Project Fund for exhibition funding in 2016. 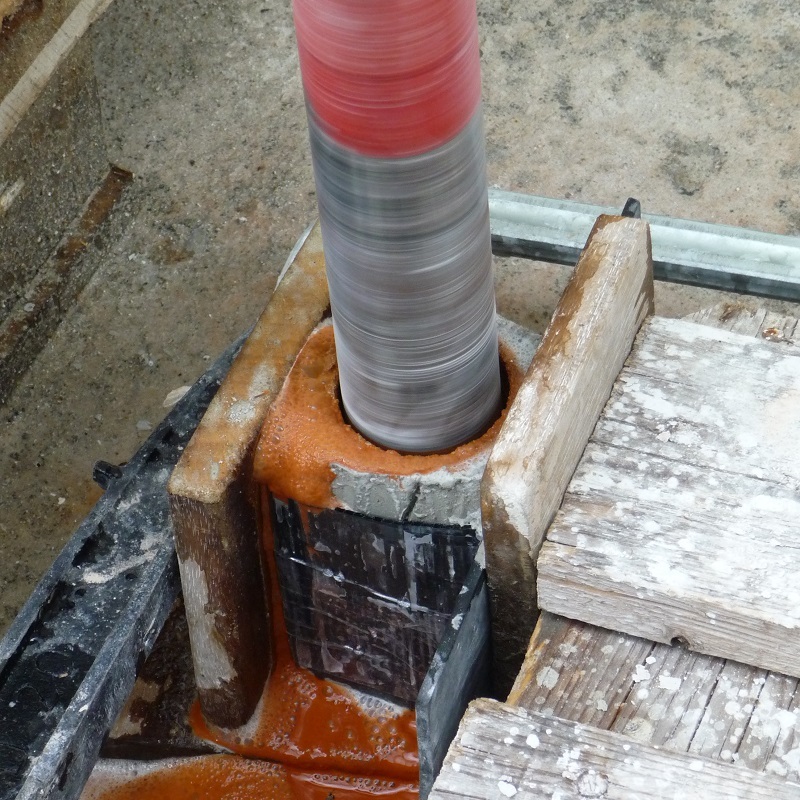 The project is inspired by drilling with 'Cup-drills' (cylinder/core drills) for example occurring at construction sites, brickwork for pipes and installations, geological ground investigations, ice core drilling, biological research, time survey, archaeological studies, and not least the left-over drill holes and the drilling cores. 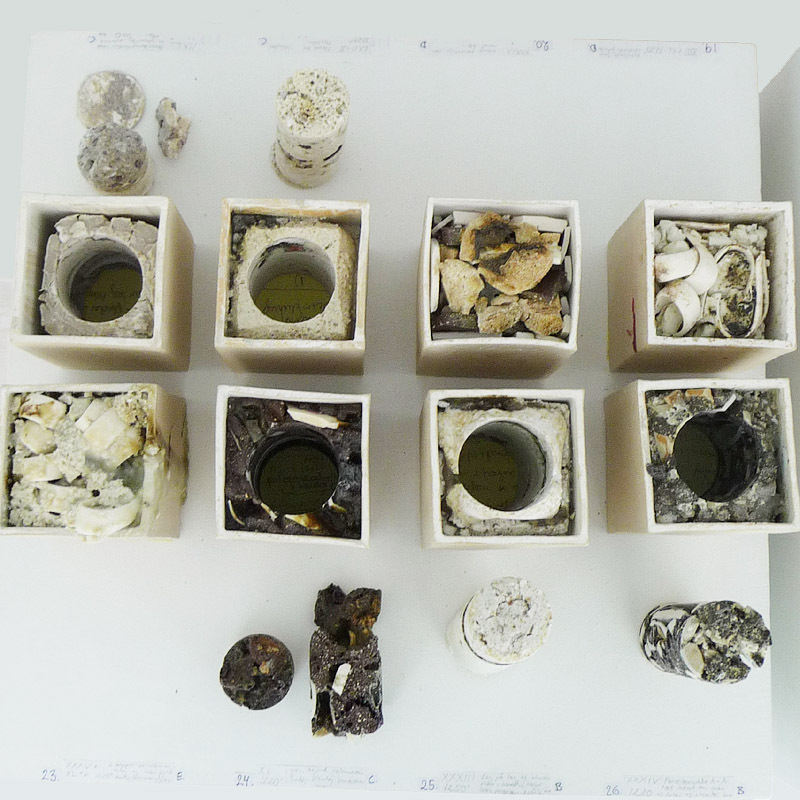 Key words: geological deposits - archaeological accumulations - time layers - time pockets - memories & secrets - conscious & unconscious - precision & randomness..
"We worked with material tests and experiments based on our individual experiences, but with the object being to challenge these experiences through interdisciplinary collaboration, differences in material knowledge, craftsmanship and artistic approach, mindset and philosophical aspects of the project itself." 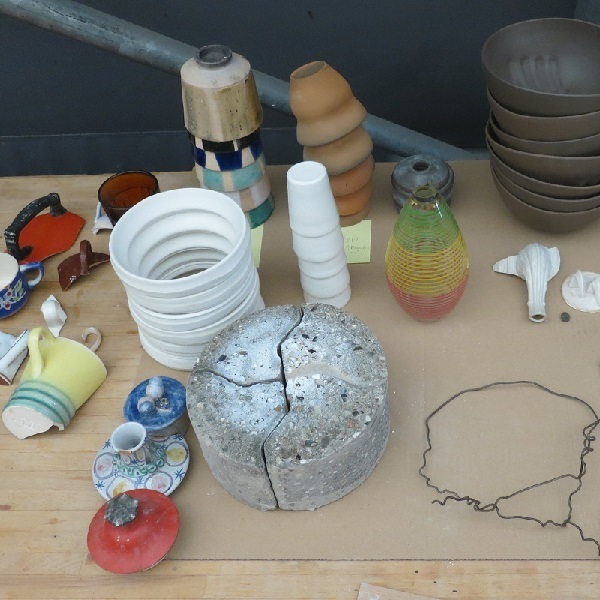 Collection and accumulation of materials - layer by layer. 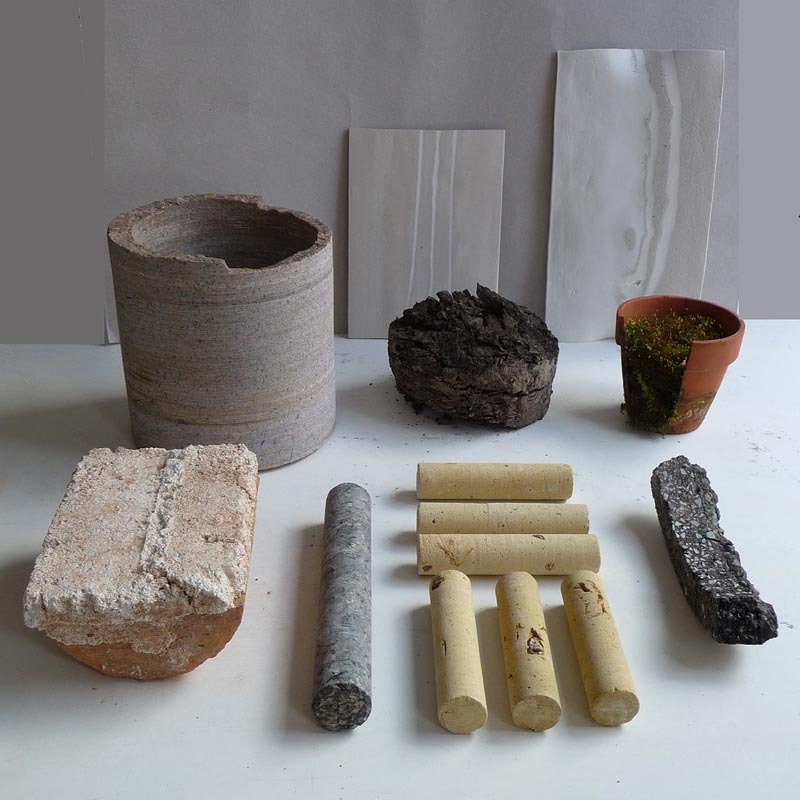 Material and form studies are mainly in clay and other ceramic materials, fired shards, but also concrete, sand, stone, cement, wood, and other matters. 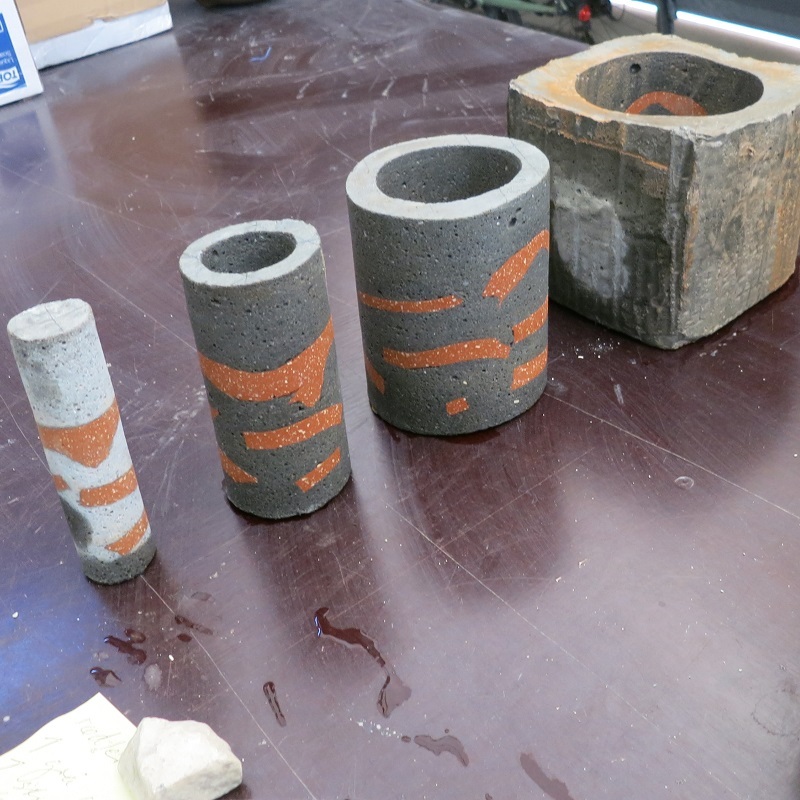 We drilled with a cylindrical Cup-drill into mixed substances, which we then fired at different temperatures or fired before drilling. 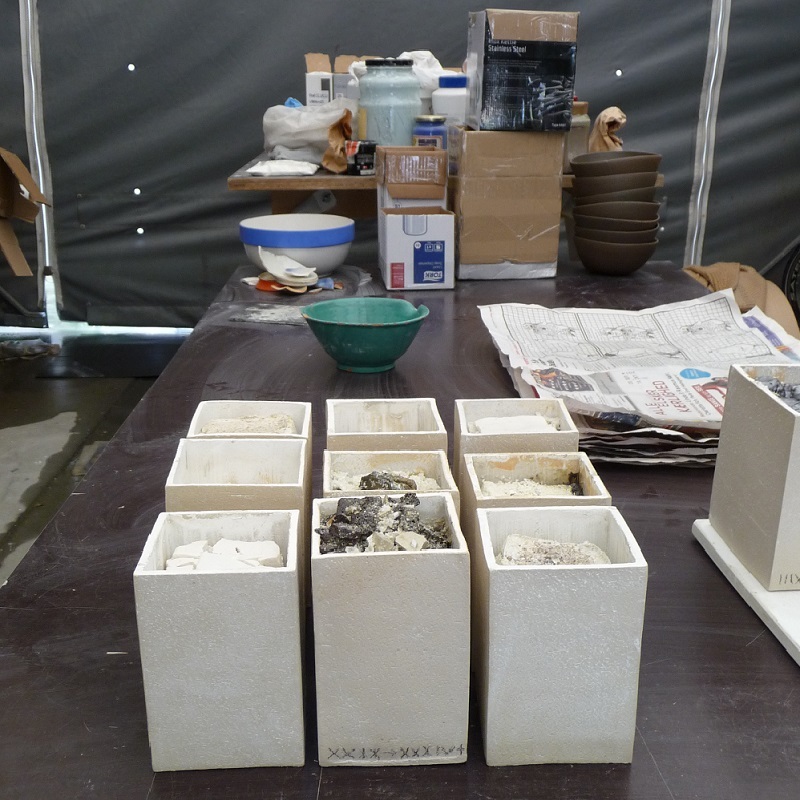 Because of melting risk in the kiln we made clay containers that were labelled and filed in a coded system. 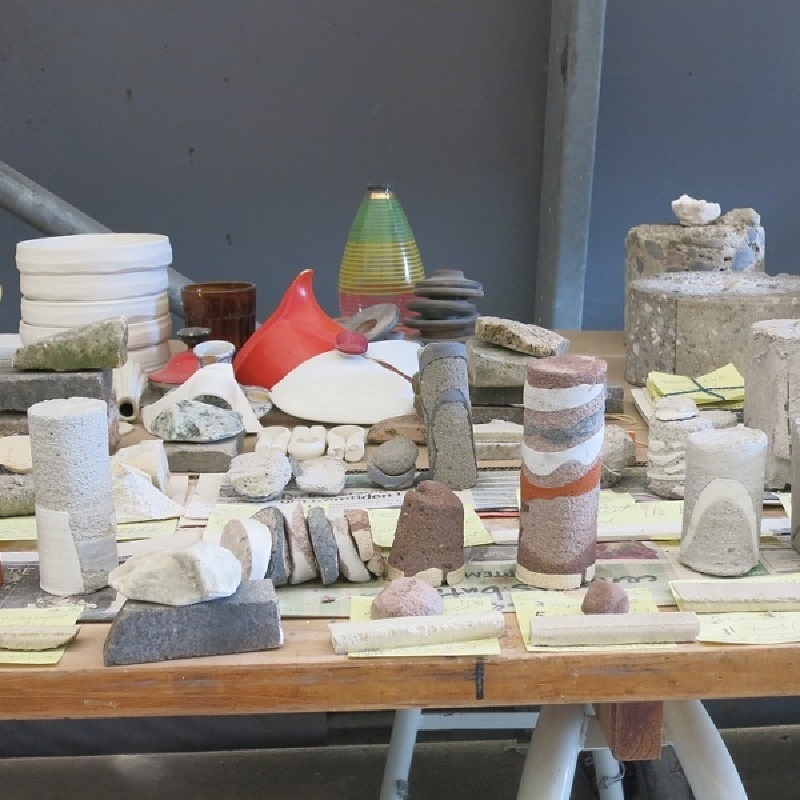 "Generally, I am inspired by what is at hand and daily chores, mechanics, tool geometry, botany, spontaneous processes, time, nature, and that of the good stuff, I can dig up from my own stash."